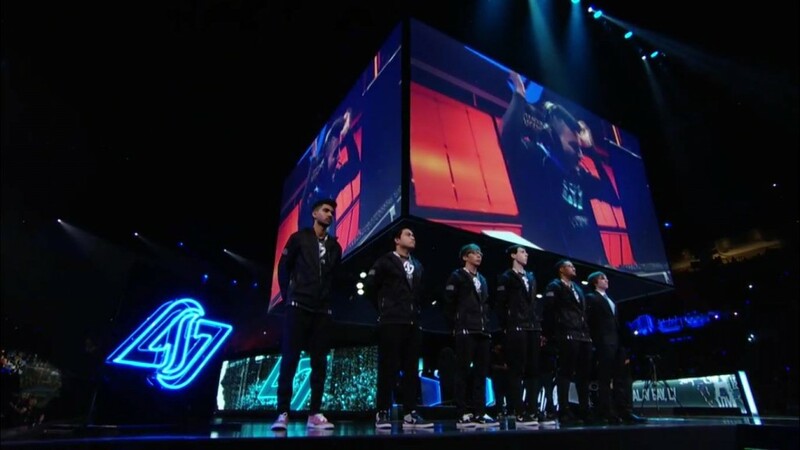 It’s Spring Split Finals weekend in the NA LCS, and Team SoloMid and Counter Logic Gaming are battling it out today for first place in the league and the 90 Championship points that come with it. 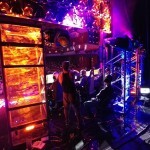 The teams are playing in front of a live audience Immortals at the Mandalay Bay Casino and Hotel in Las Vegas. 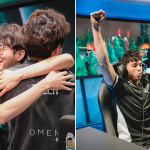 When TSM were struggling just to win games during the regular season, it was hard to imagine the team would be in the position to claim the Spring Championship today. 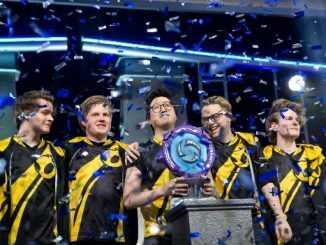 That said, the squad is packed with talent who know how to perform in high pressure situations, which explains their thorough dismantling of top seeded Immortals in the semi finals. 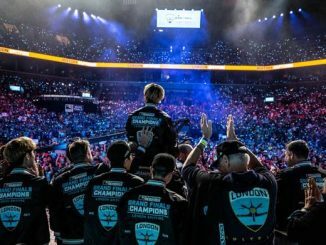 CLG didn’t have an easy road to the finals either, as Team Liquid put up a strong effort against them in the semi finals. I’ll be with you throughout the match providing live updates. You can join in the discussion by tweeting with the hashtag #ESSLCS during the match. 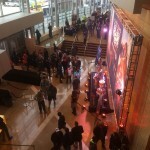 I’ll post some of the wittiest observations and the dankest memes here in the live blog. 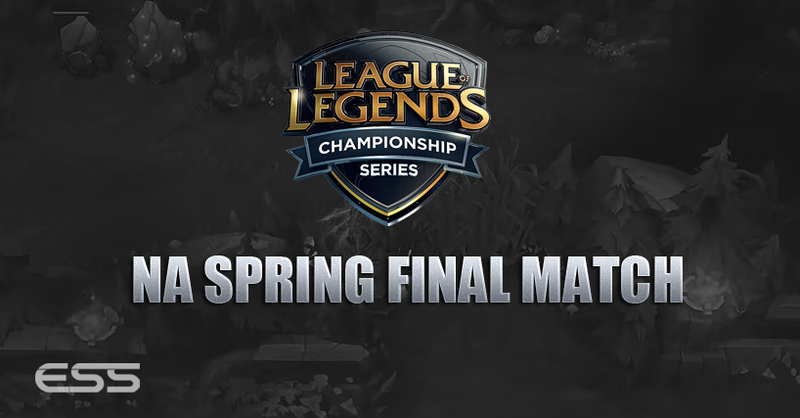 Hello and welcome to the NA LCS Spring Split final. It is El Classico. It is CLG vs TSM. 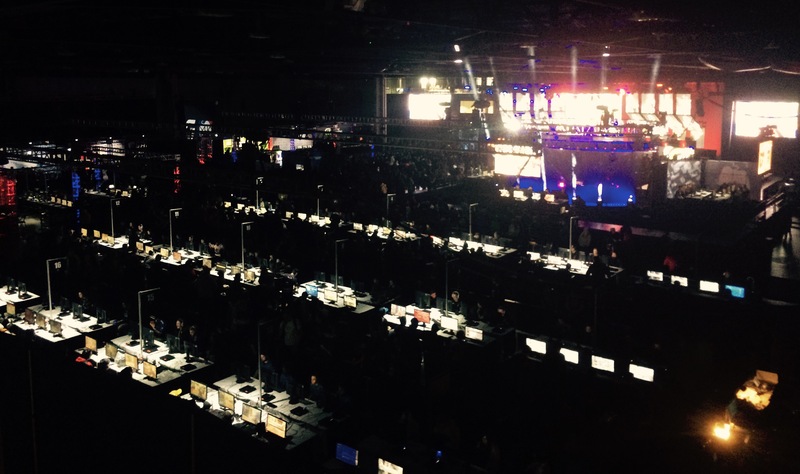 The road to the final for TSM and CLG. 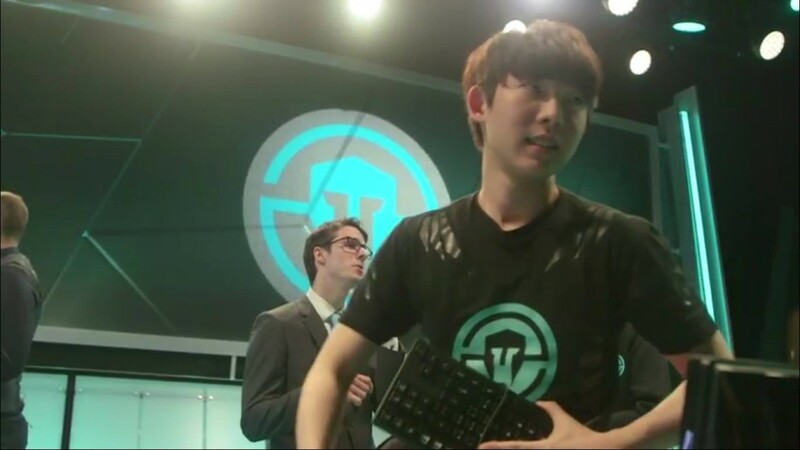 MVP of the Spring Split is Reignover. Whilst we wait to get underway, here is a comparison of the top lane match up. 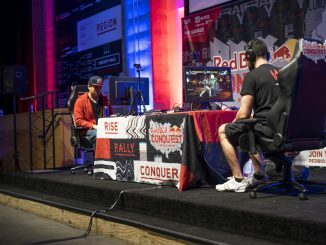 The jungle matchup. 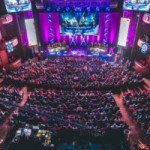 Both players performed to the highest level in the semi-finals against MVP of the Split and Rookie of the Split, Reignover and Dardoch. 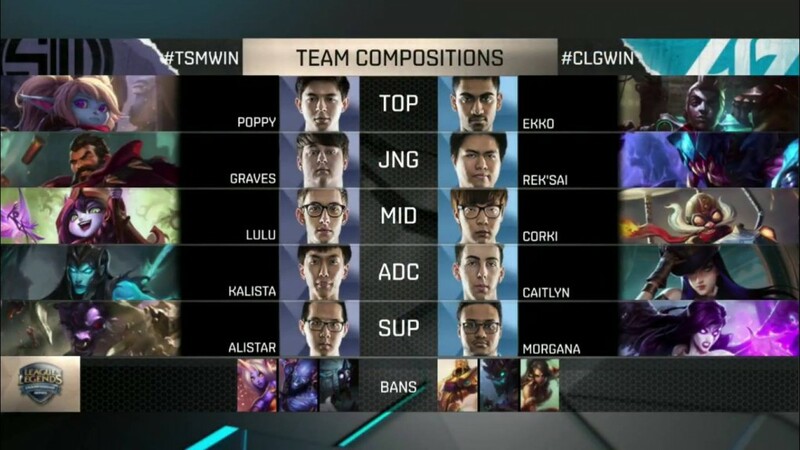 Here is the matchup at ADC. 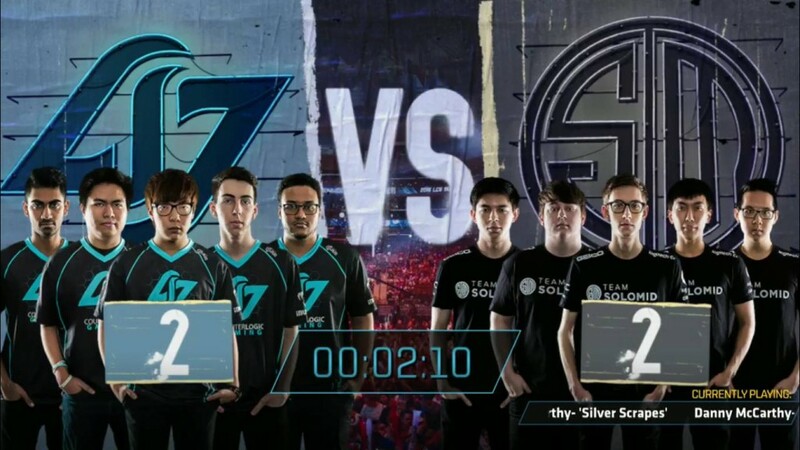 Doublelift is a star and Stixxay, his replacement, has had a good opening Split. The bans are in! A lot is left up. The pick and bans are in, lets go! Lane swaps for both teams here. 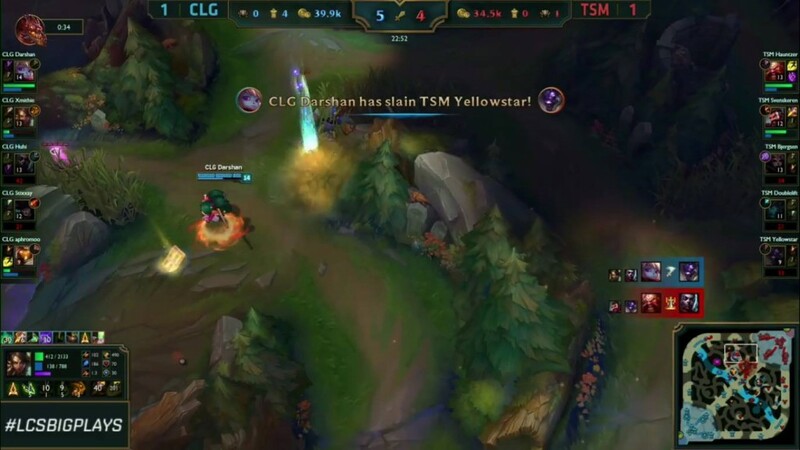 CLG and Darshan have an early advantage as the Poppy is able to get level 2 quicker. 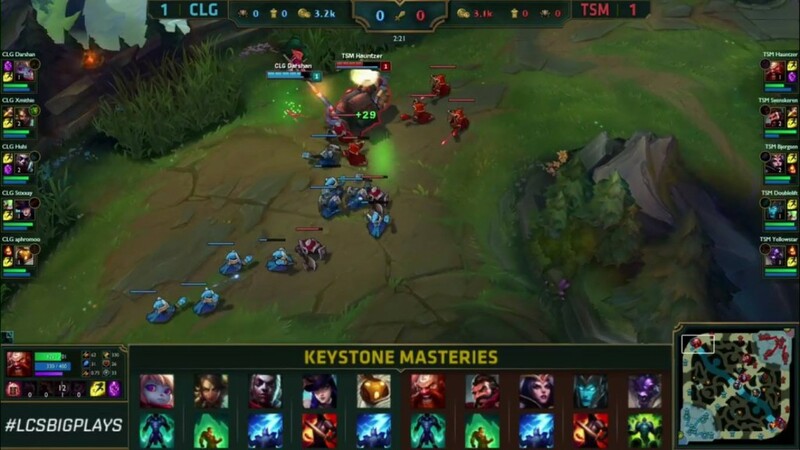 Keystone Masteries for both teams – no action just yet and both teams joint in gold. 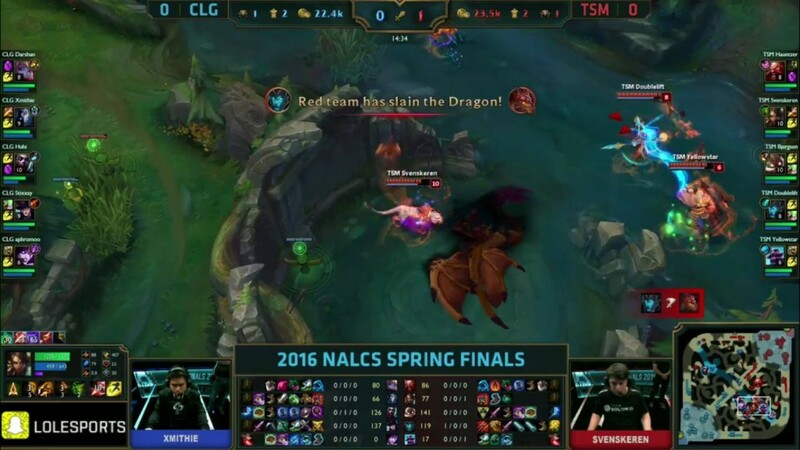 CLG take the first dragon of the game. 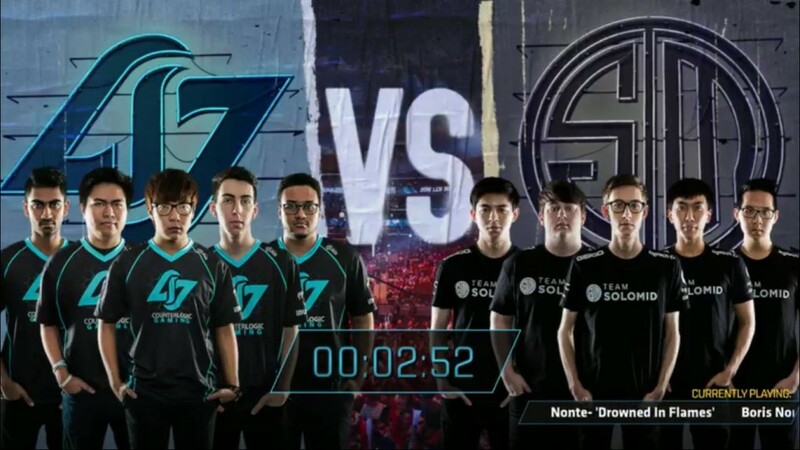 The 3 man squad of Svenskeren, Doublelift and YellowStar are able to catch out Huhi in the mid lane. 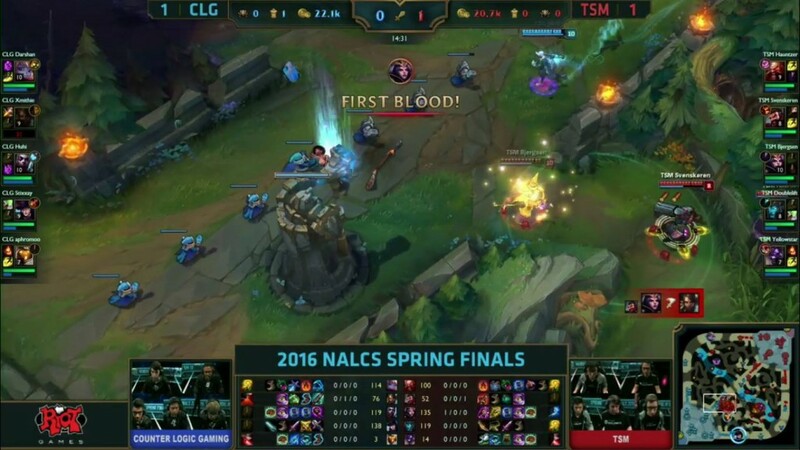 First blood for TSM! 2K early gold lead for TSM. 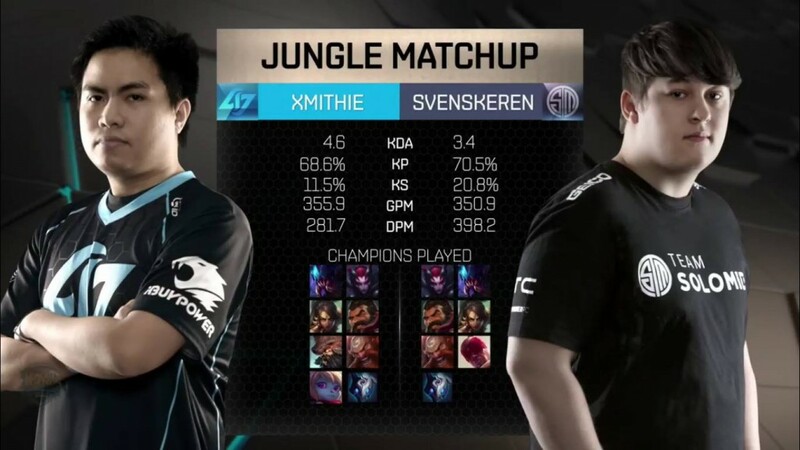 Svenskeren has 2 levels on Xmithie in the jungle here. 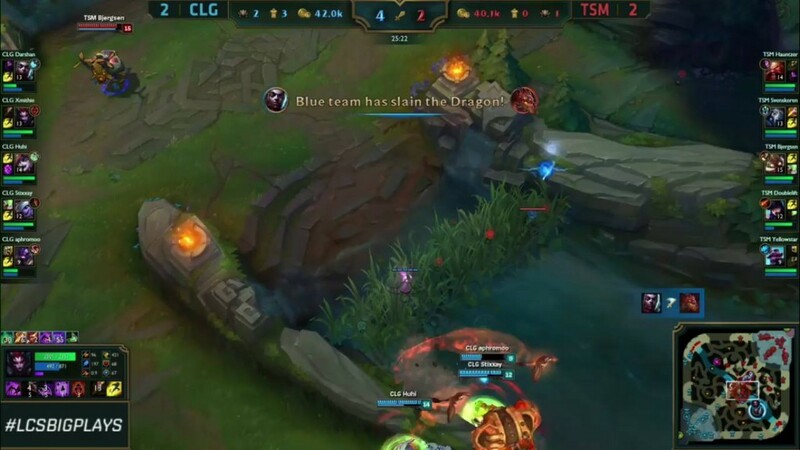 TSM get their first dragon of the game. 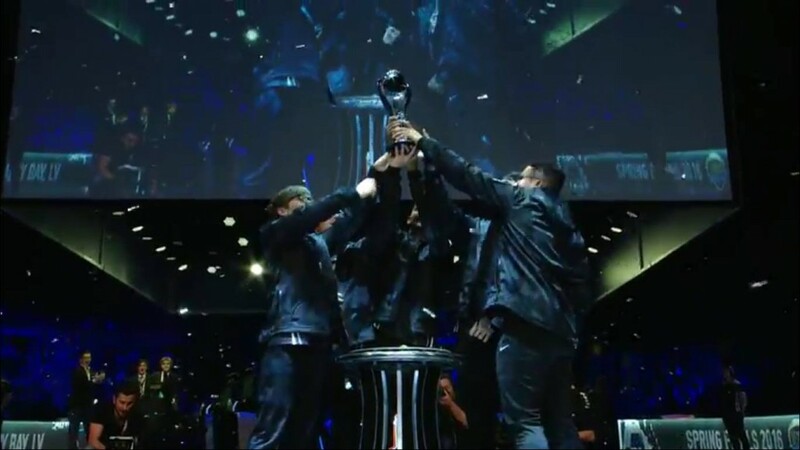 TSM take the 2nd dragon. Hardly any kills in this game, but the next team fight will be huge in this league of huge death timers. 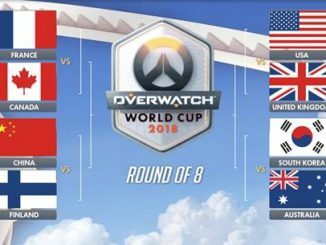 There hasn’t even been sight of a team fight yet. 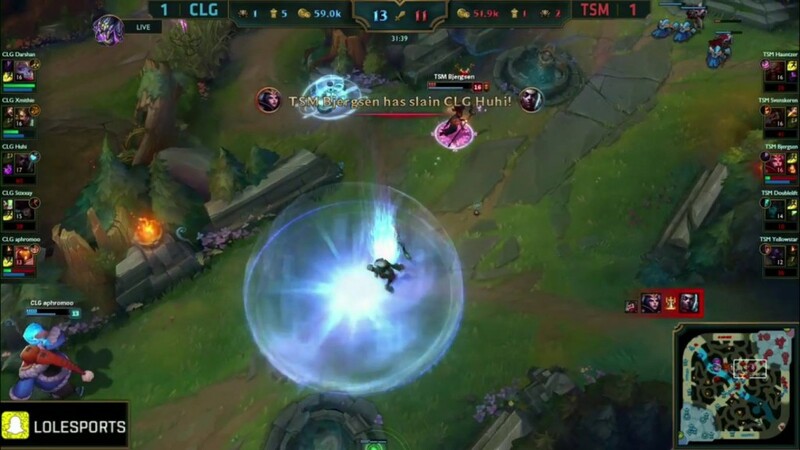 CLG take mid turret. A double teleport from CLG, one from lane and one from base with home guards. Huhi and Darshan clean up the back line! 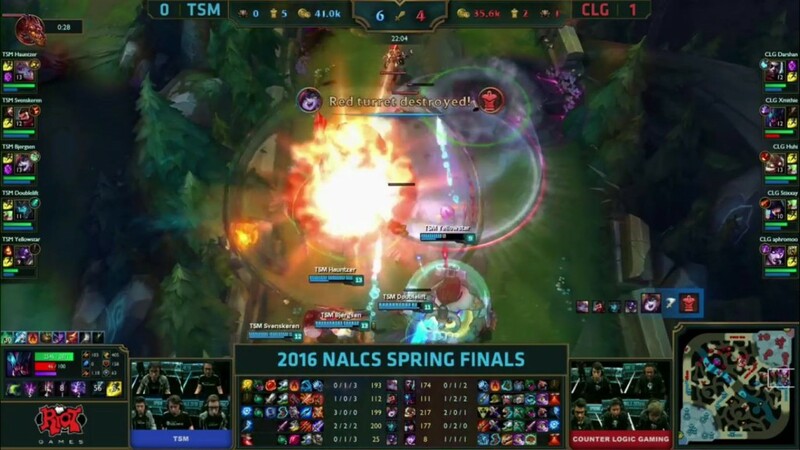 4-0 team fight for CLG and they go and get baron. Beautiful execution. Oh wow! Another lovely team fight execution, but this time its from TSM! 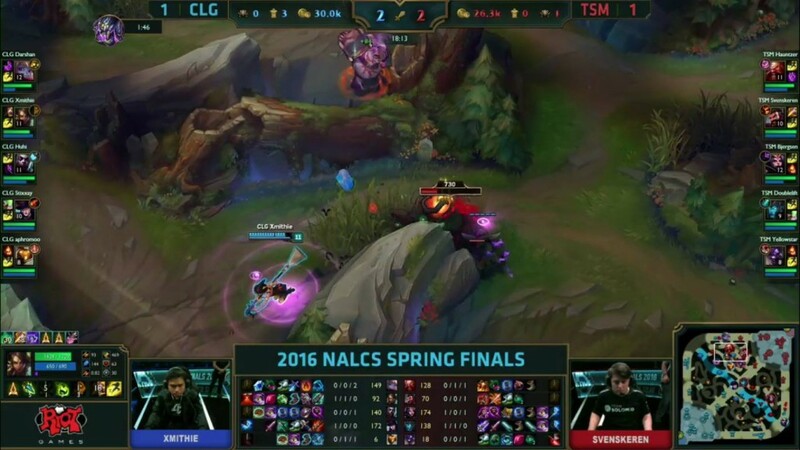 Hauntzer teleports to a nearby ward and Bjergsen comes from mid and they completely destroy a CLG team that was grouped at bottom tower. Ace for TSM! 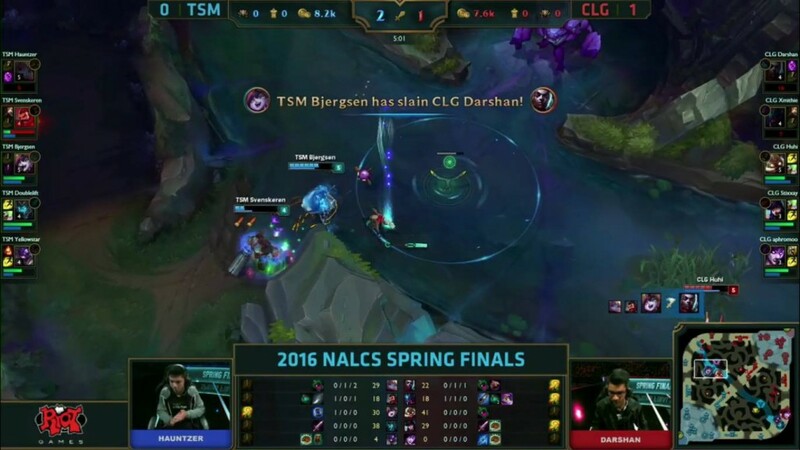 TSM think they’ve caught out Darshan but the rest of CLG collapse so quickly! 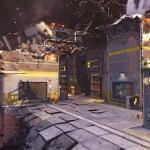 A split second decision sees them respond with 3 kills of their own – they push on to grab the inhibitor! After a slow start this is turning into such a good game! 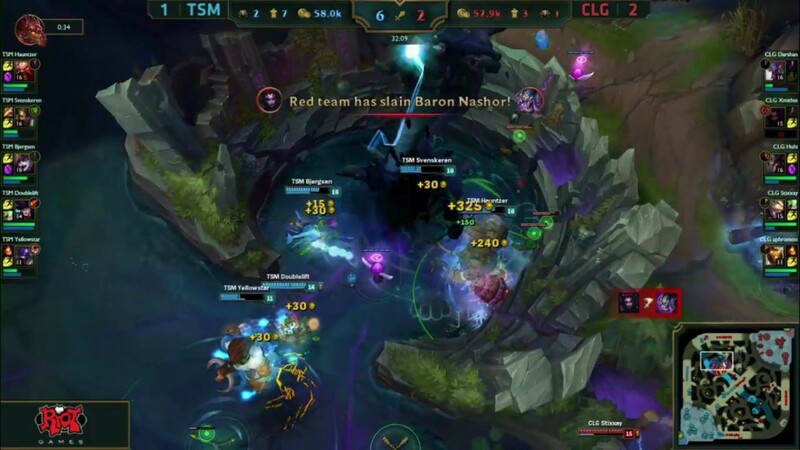 TSM rush down baron and manage to take down Darshan who tries to cut them off around the backside. 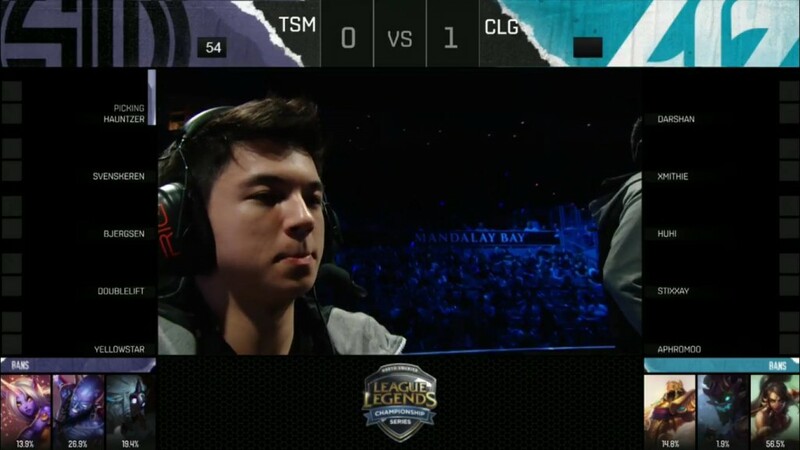 Hauntzer goes down to Xmithie and TSM have to run – luckily for TSM they make it out with a slither of health. 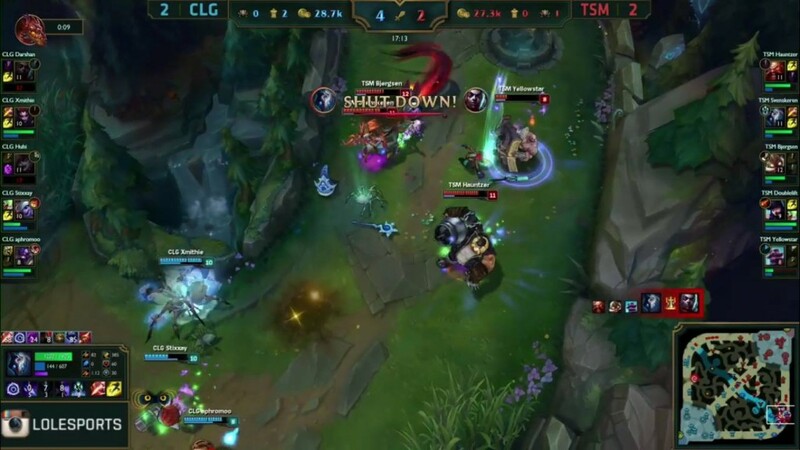 A flash bind onto Svenskeren from Aphromoo tilts the team fight into CLG’s favour – they wipe out 3 members of TSM and are able to take 2 inhibitors. 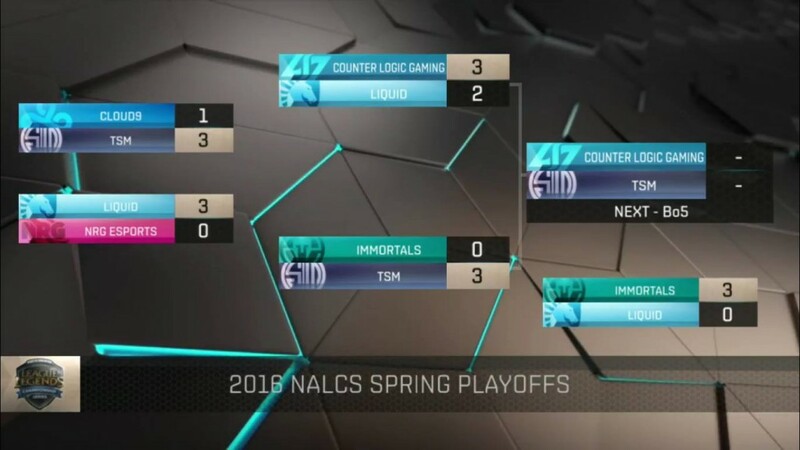 How will TSM respond? That’s their first loss in 6 games! 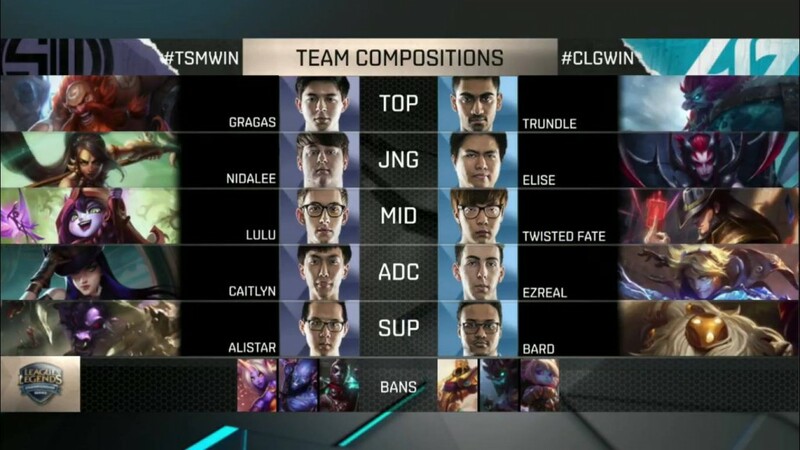 Pick and bans are in, can TSM pull it back? Standard lanes here, should see more fighting than we did last early game. 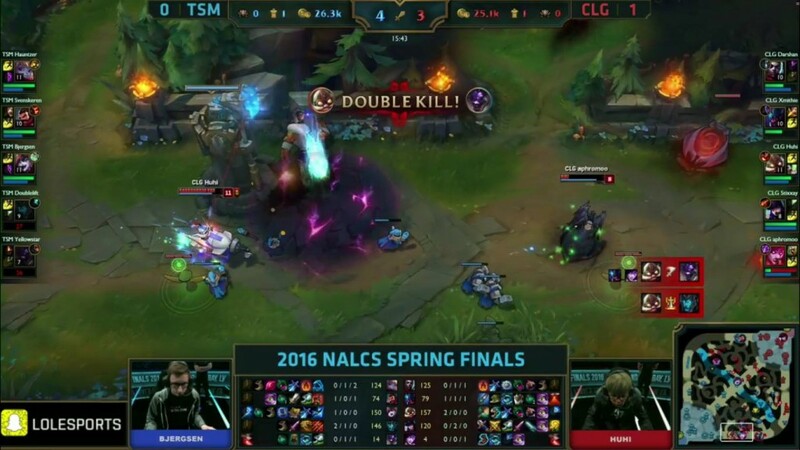 Xmithie takes down Hauntzer for first blood – but TSM respond with 2 kills of their own onto Darshan and Xmithie! 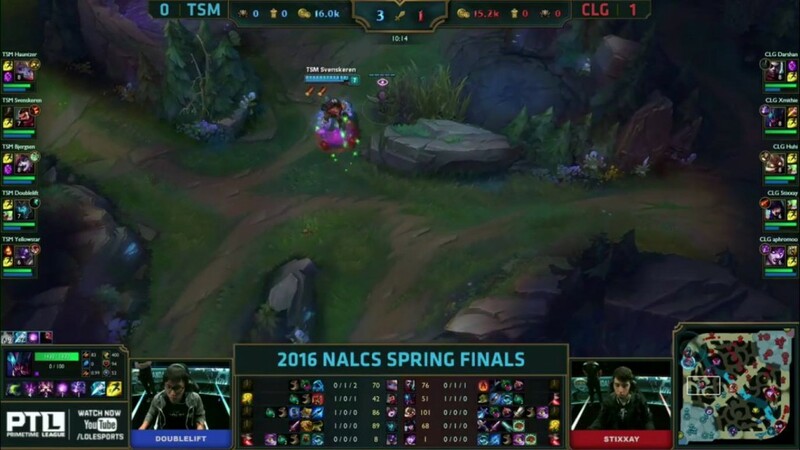 Doublelift takes down Stixxay bottom lane, Aphromoo just manages to escape. 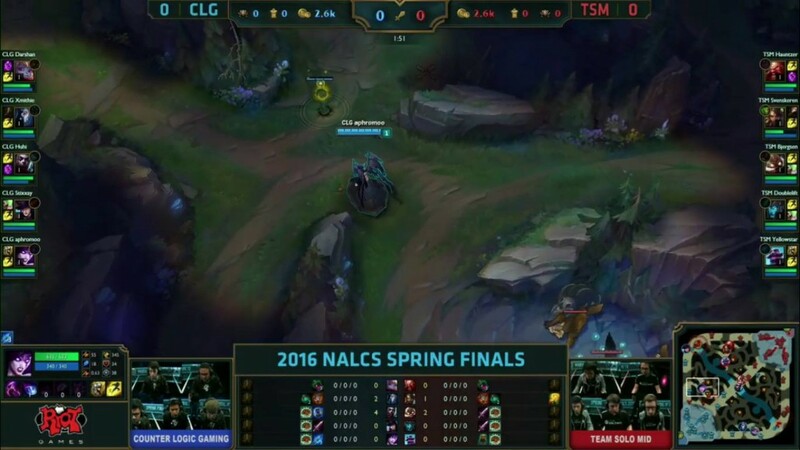 10-minute update as Doublelift and Yellowstar continue to bully CLG’s bot lane. Doubelift nearly 20 CS up at the moment. 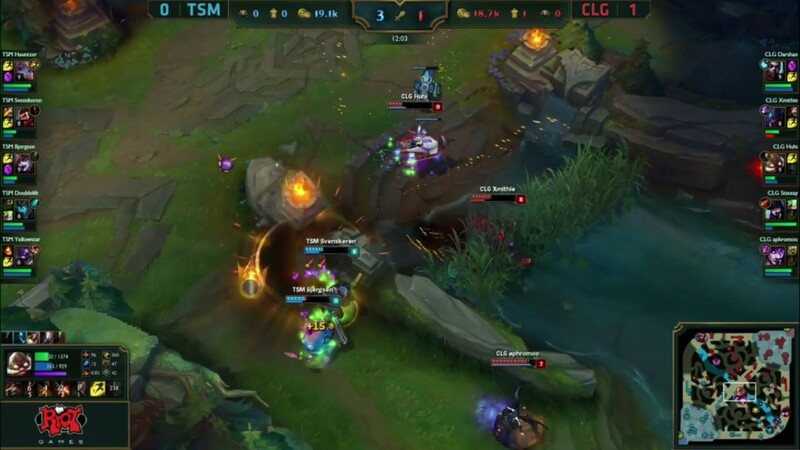 A skirmish mid between the mid lane and jungle of both sides sees an even affair – Aphromoo roams mid though and manages to burn both of TSM’s flashes. 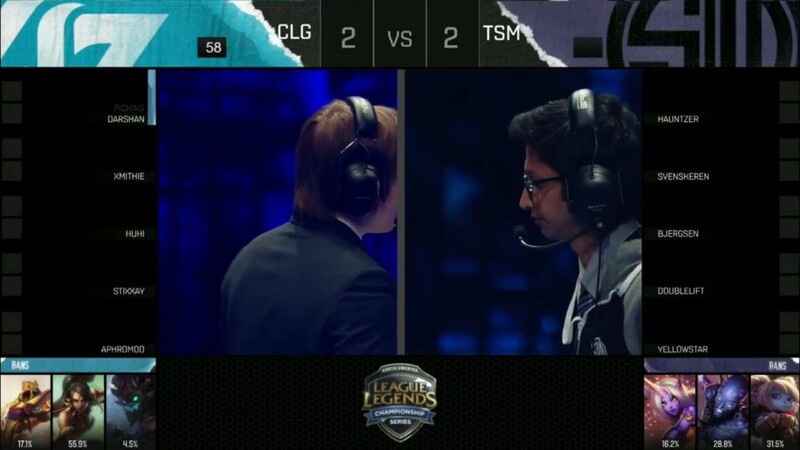 Doublelift and Yellowstar are able to take out Stixxay – but a roam by Huhi and Darshan means that TSM are outnumbered. They’re able to collapse in on the bot lane duo and get the 2 kills. 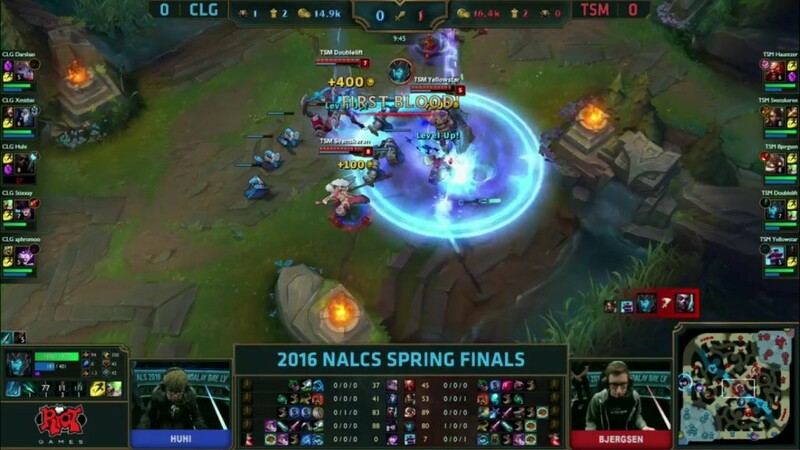 CLG waste multiple flashes but an Aphromoo bind is able to get Doublelift early on this fight – but from there on out, TSM win the fight 2-1. TSM take bottom tier 2 and back off. I say they back off…but then Svenskeren is caught by a nice binding from Aphromoo. He goes down and CLG manage to get their 2nd dragon of the game. A huge 4 man knock up by Yellowstar sees TSM pick up the kills! They go to baron, secure it and ace CLG! TSM WIN. 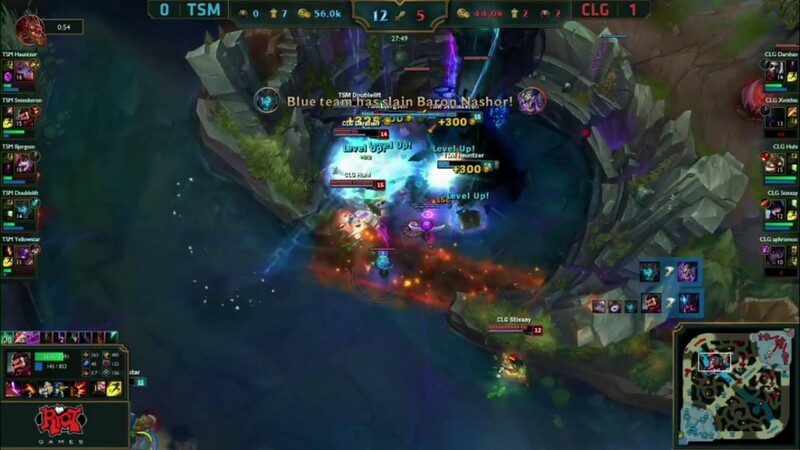 The baron and the clean up that saw TSM push on to win the game! 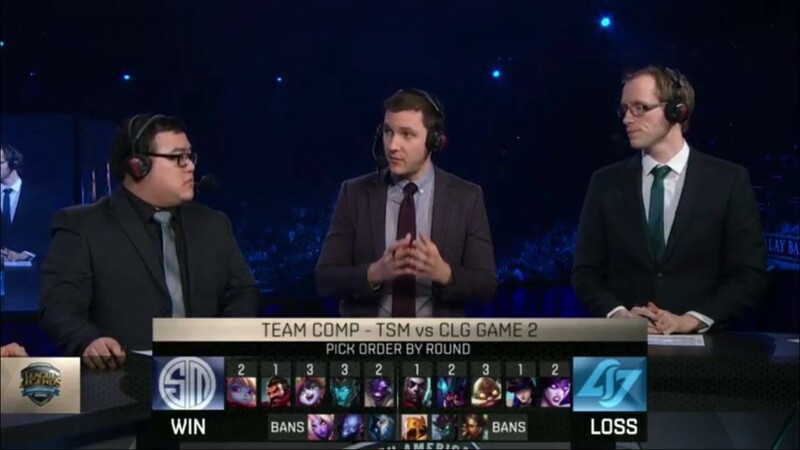 It was a good pick and ban phase for TSM. With two jungle champions banned (Nidalee and Kindred), Svenskeren was able to pick up the last aggressive jungler in the meta. The bans are in for Game 3. The pick and bans are in! 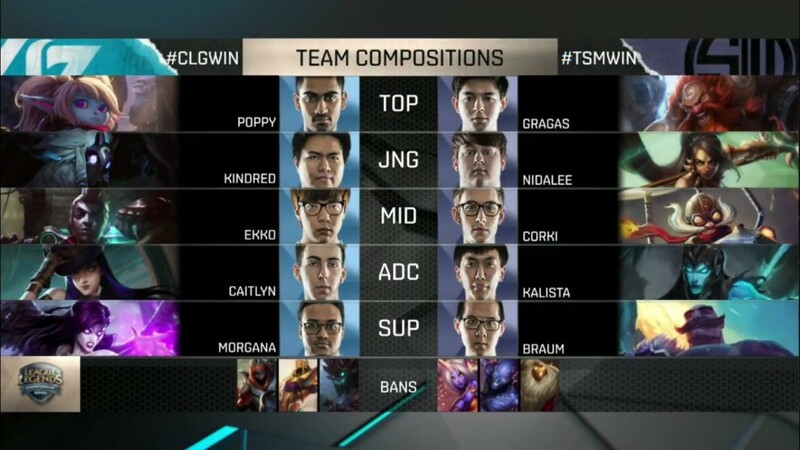 Bjergsen on an assassin, should be fun! 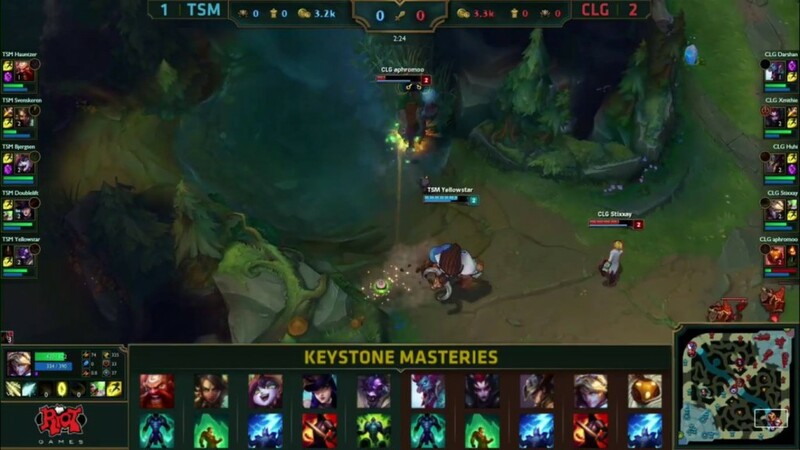 Keystone Masteries for each team. Standard lanes again, CLG should have the advantage down bot. Hit level 2 first and have a range advantage. A gank by Xmithie sees Yellow and Doublelift both burn flash. 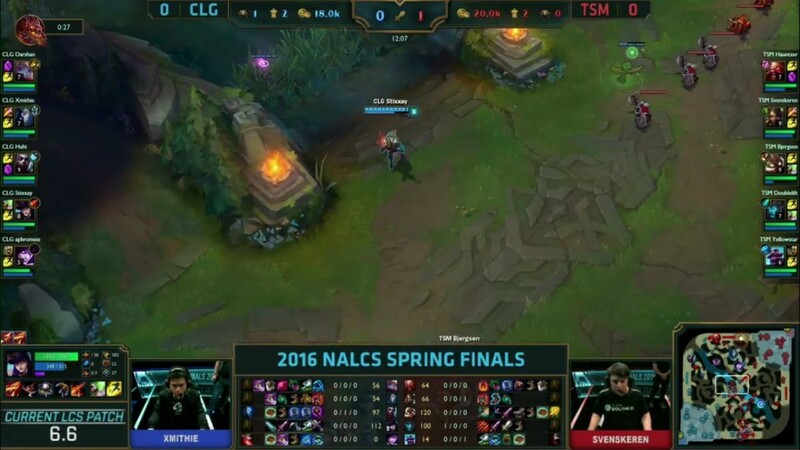 Xmithie is all over this map and its resulted in Stixxay beating Doubelift by 20CS. 11-minute and still no kills just yet. 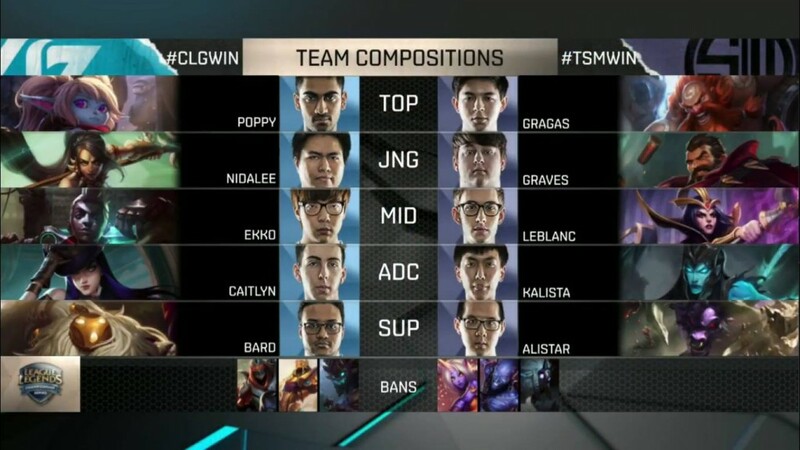 CLG have a 0.7K gold lead and Stixxay has the highest CS in the game. 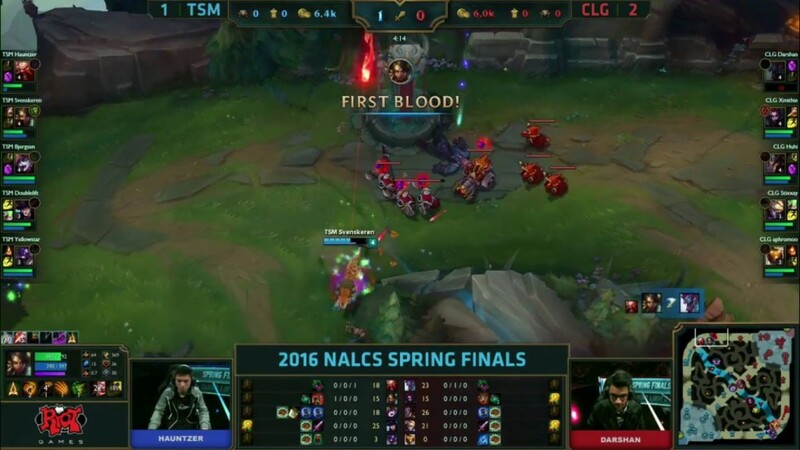 Finally, FIRST BLOOD FOR TSM! 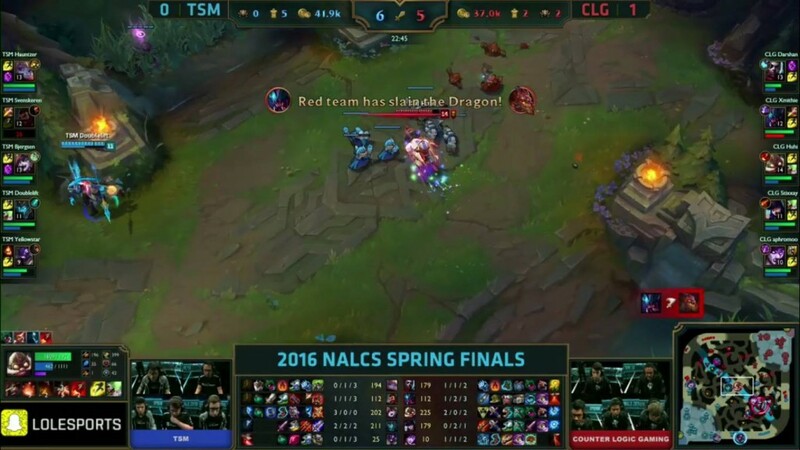 Both teams are battling over dragon pressure but Xmithie gets caught out by Bjergsen! 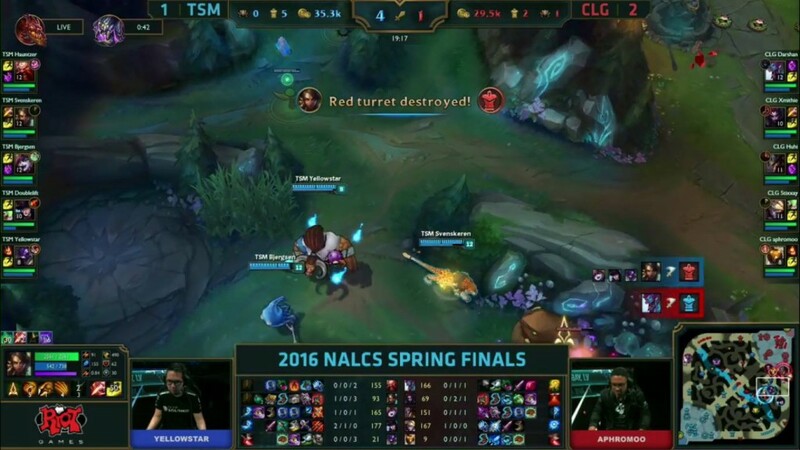 TSM rotate back to mid lane and are able to pick up a kill on Aphromoo but cant’ secure the turret. 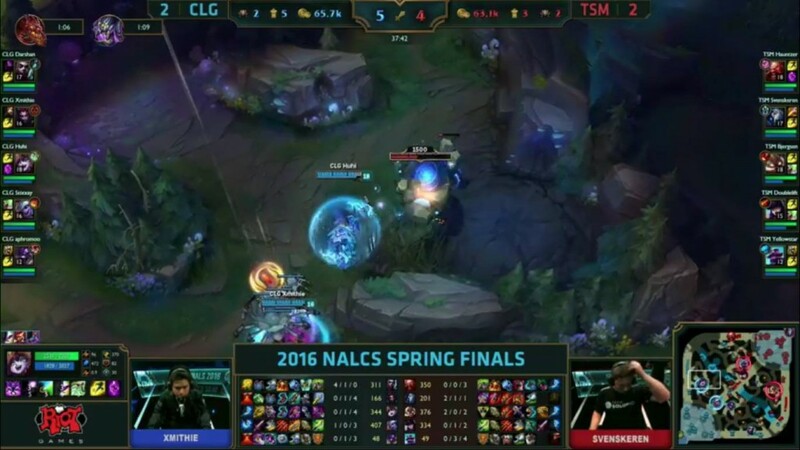 Xmithie catches Hauntzer and the rest of CLG is able to collapse onto Doublelift and Yellowstar. Doublelift goes down but Yellowstar flashes out to survive. TSM take dragon. 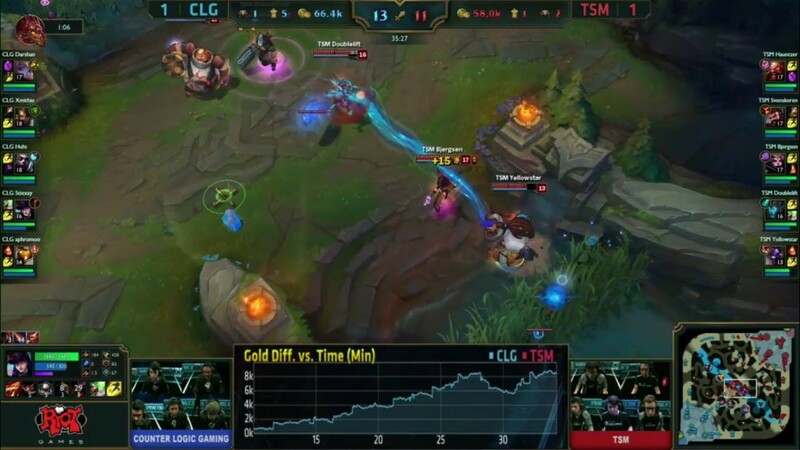 CLG nearly 4k gold up due to them taking 3 towers. TSM yet to take one. 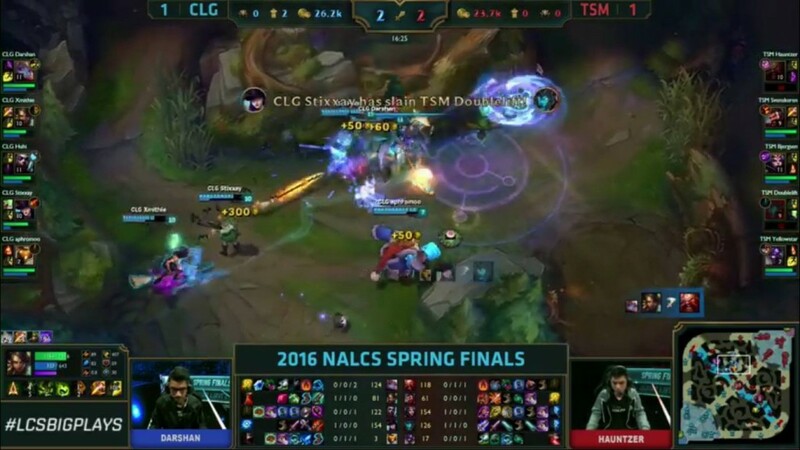 CLG out rotate TSM and are able to take top tier 2 turret. 4 turrets to 0 now for CLG, 5K gold up. 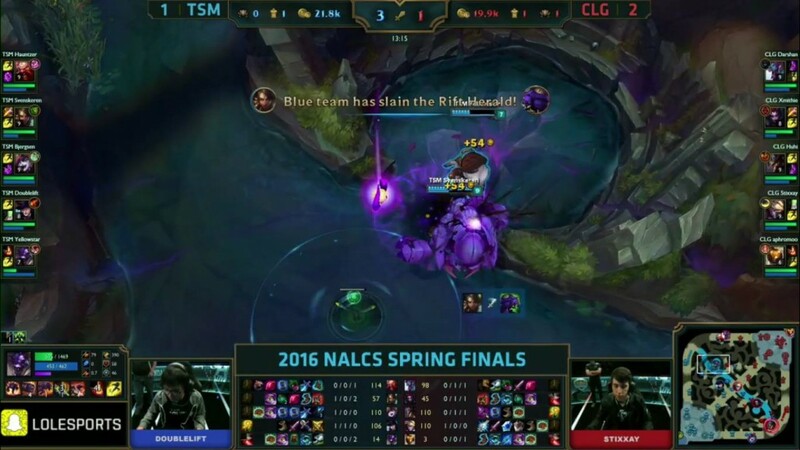 Huhi was huge in this team fight! 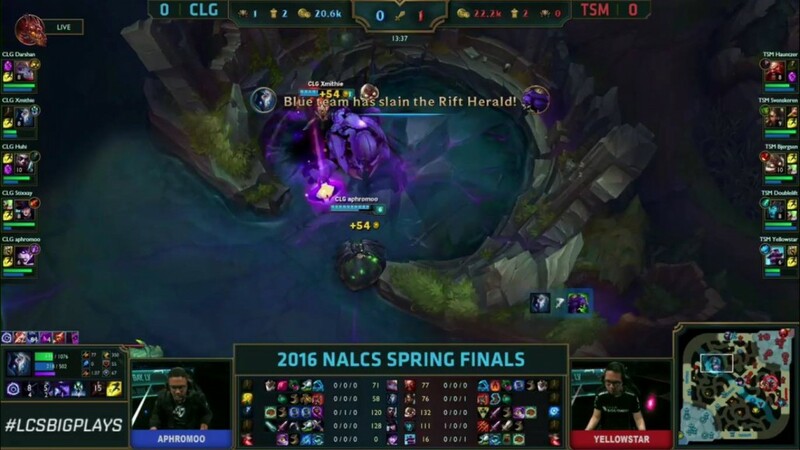 YellowStar catches out Stixxay and Huhi but a pin-point bard ultimate bides time for the rest of CLG to collapse. They end up winning the fight 3-2 and can take baron off the back of it. That fight was so close! 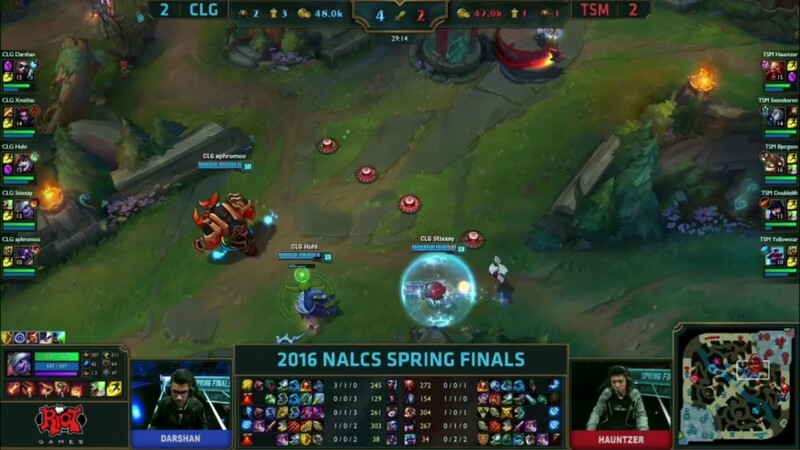 CLG and Aphromoo start that fight with a Bard ult but Darshan goes down so early. 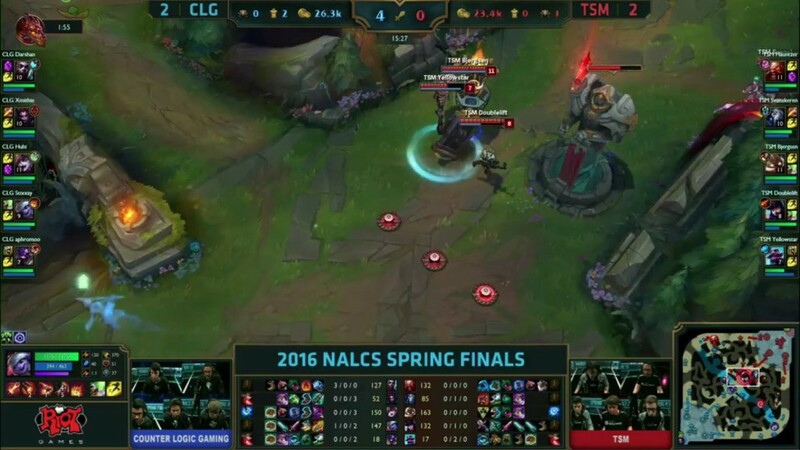 Stixxay manages to get a double kill though and the fight goes 2-1 again in CLG’s favour. The gold lead increases further to an 8K gold lead. A huge ultimate by Hauntzer catches Stixxay. A Bard ultimate saves Stixxay for the time being but he flashes into Hauntzer and can’t lay down much dps in this fight. Huhi teleports into a nearby bush but he’s already low! He gets taken out so easily. 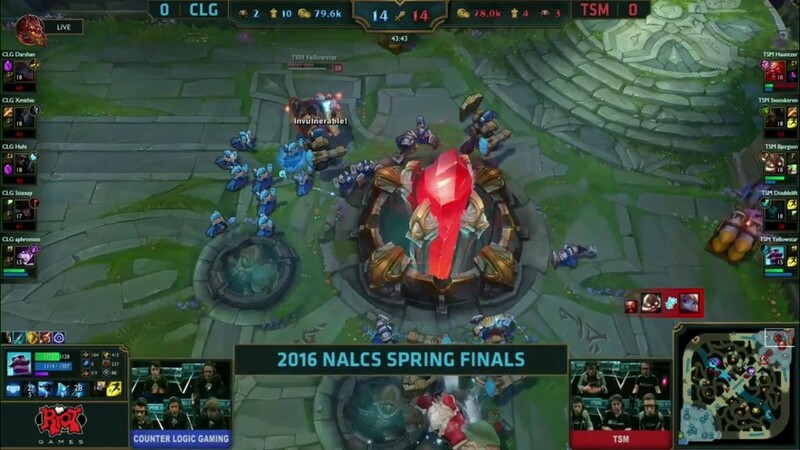 A huge win for TSM! They push on to grab a turret. 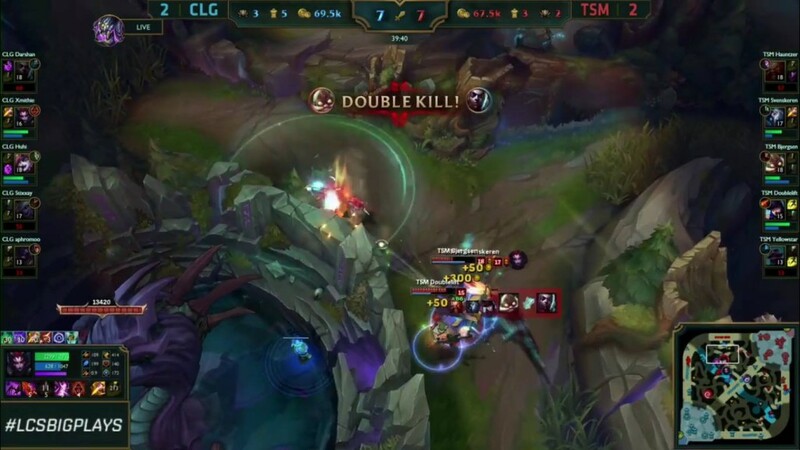 A binding by Aphromoo gets a stun on both the ADC’s on TSM, huge! 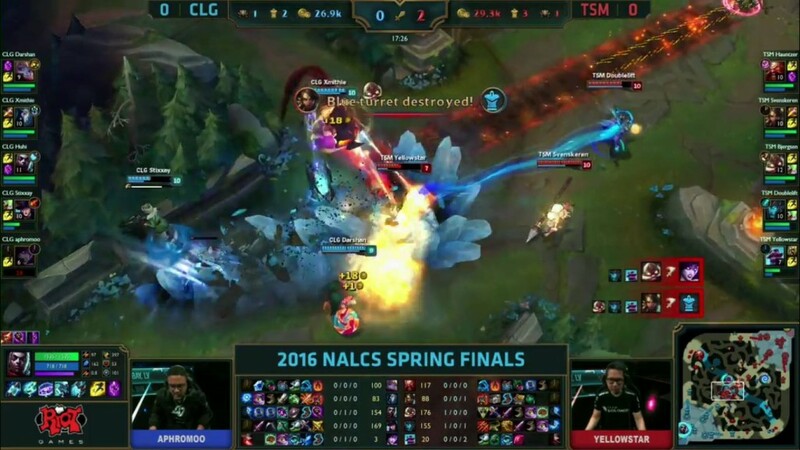 The rest of CLG clean up but Bjergsen is able to delete Stixxay. 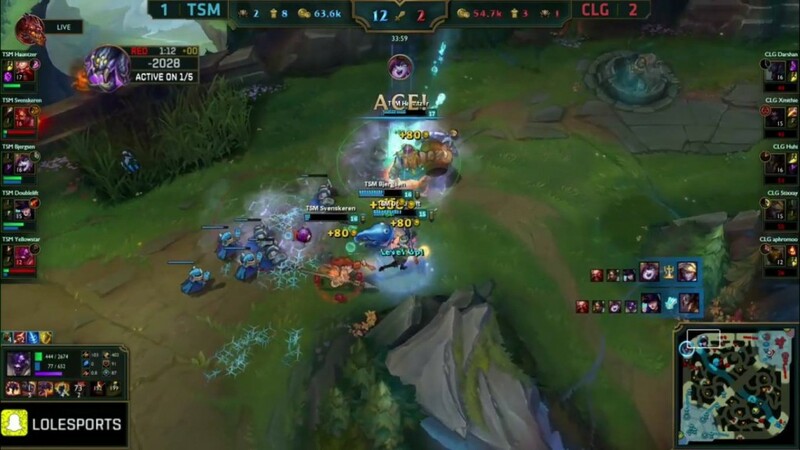 CLG take down 4 members of TSM and Huhi tries to catch Bjergsen for the ace but Bjergsen out plays him! 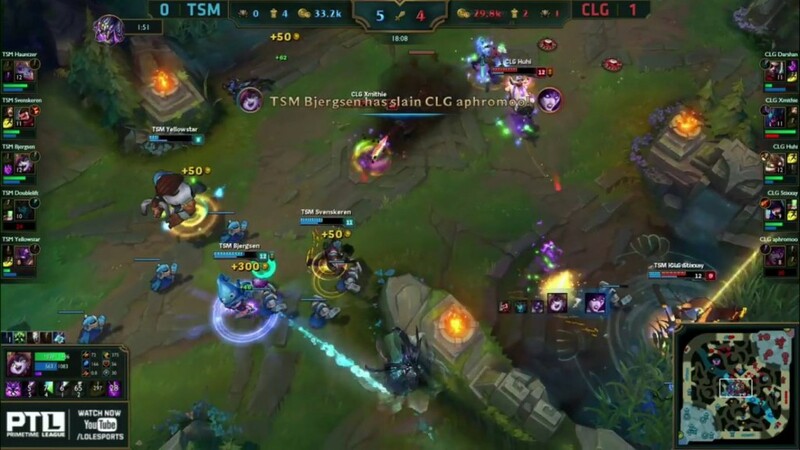 Beautiful play by Bjergsen but CLG are able to get baron. 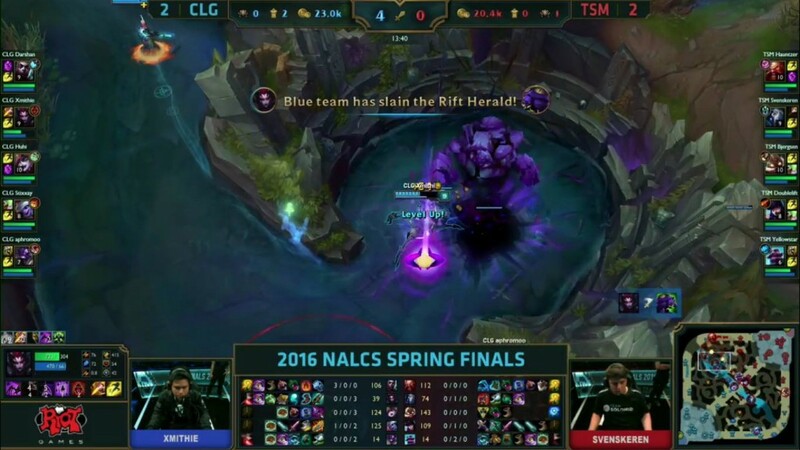 CLG have literally been in control of this Game 3 all game. They’ve never lost the gold lead. Oh wow! 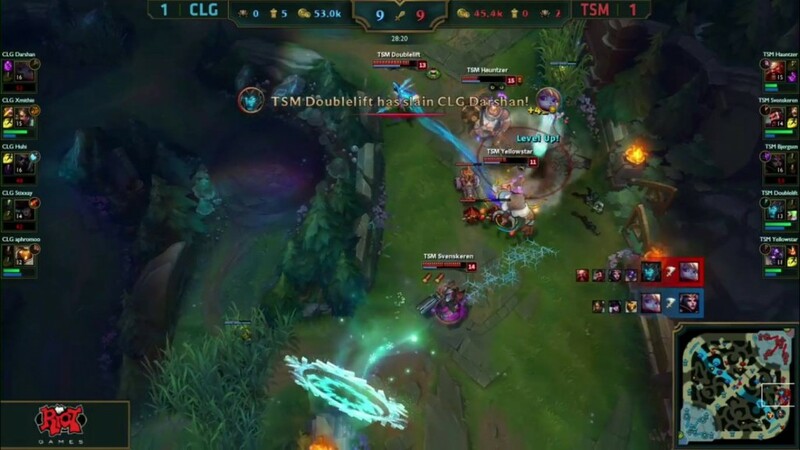 CLG give up dragon to TSM and are able to get two inhibitor turrets – but on the way out TSM are able to clear them up, a scrambled team fight results in an ace! TSM pick up 3 turrets off of this too. They’re only down 5K gold now. These fights are insane! 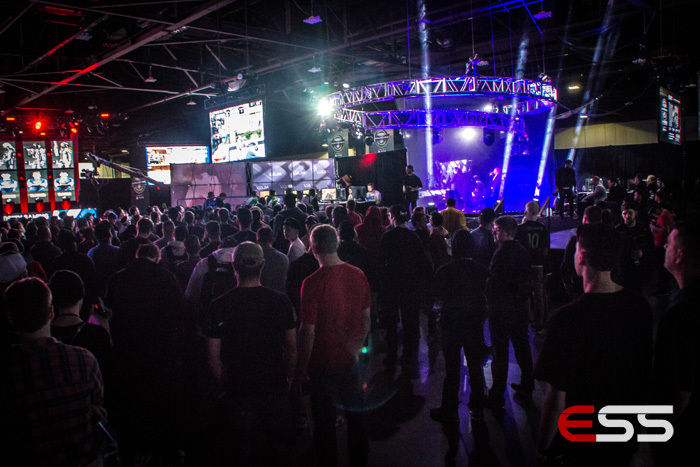 This series insane! What a game. 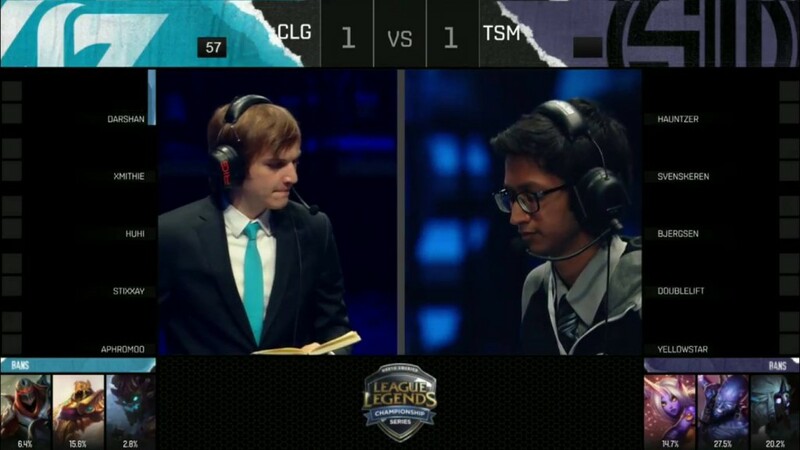 It looks like TSM have got it – they take down Aphromoo early and Doublelift manages to pick up a double kill. 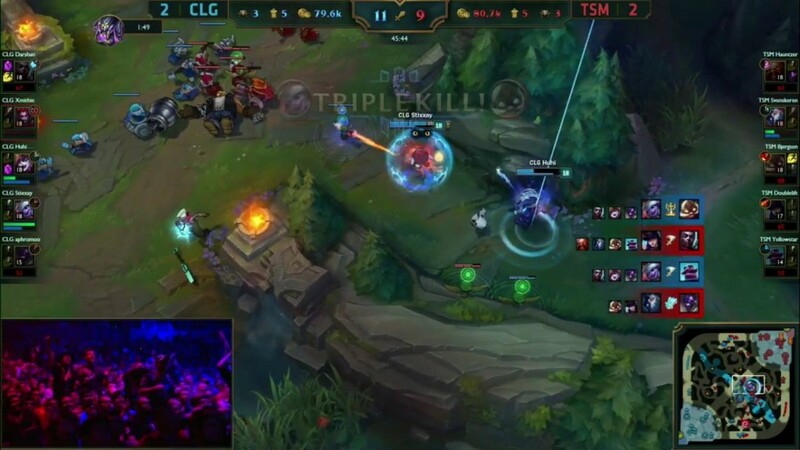 The fights are so spread out and you don’t even notice Stixxay kiting and picking people off – he gets a triple kill and Darshan is able to chase down Doublelift and Yellowstar. They ace TSM and take the win. That fight was so insane and spread out. 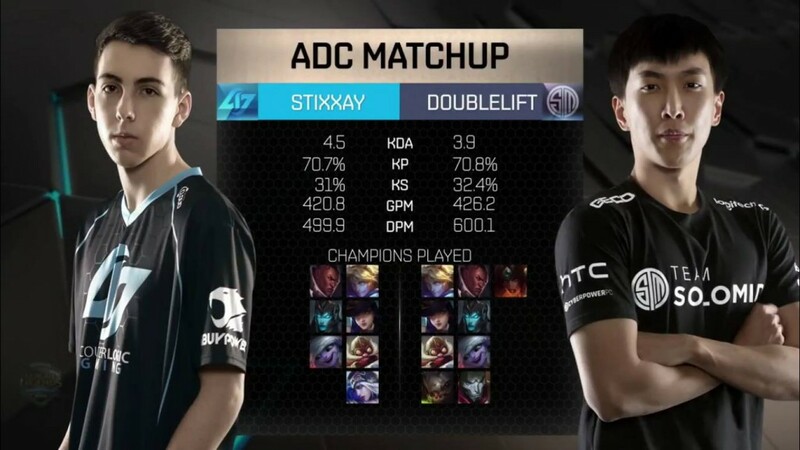 Look at Stixxay though, he plays it safe the whole team fight and is able to come up big. 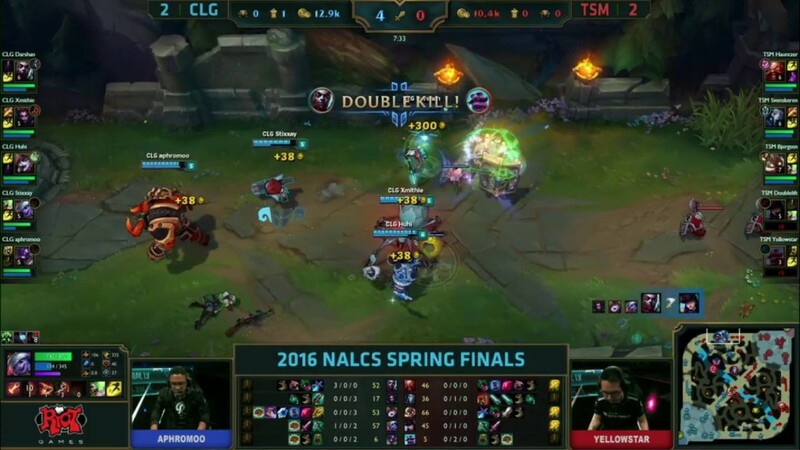 Doublelift has got a double kill and there is 4 members of TSM left. 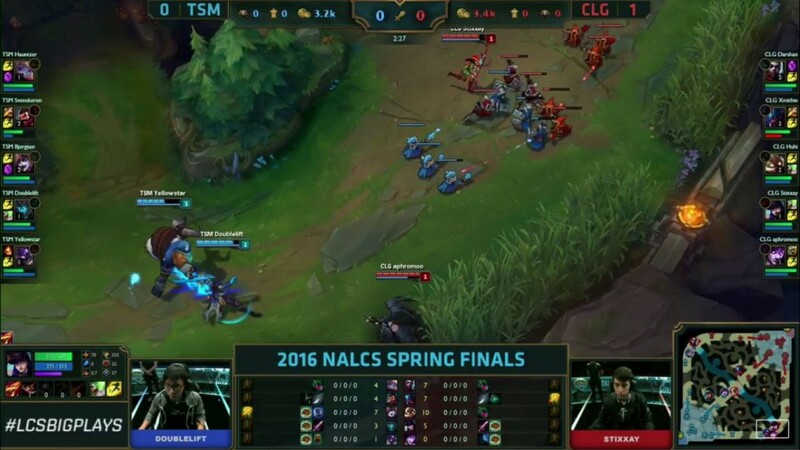 Stixxay is able to take out Sven, Hauntzer and Bjergsen here. Huge play. The bans are in. Picks to follow. 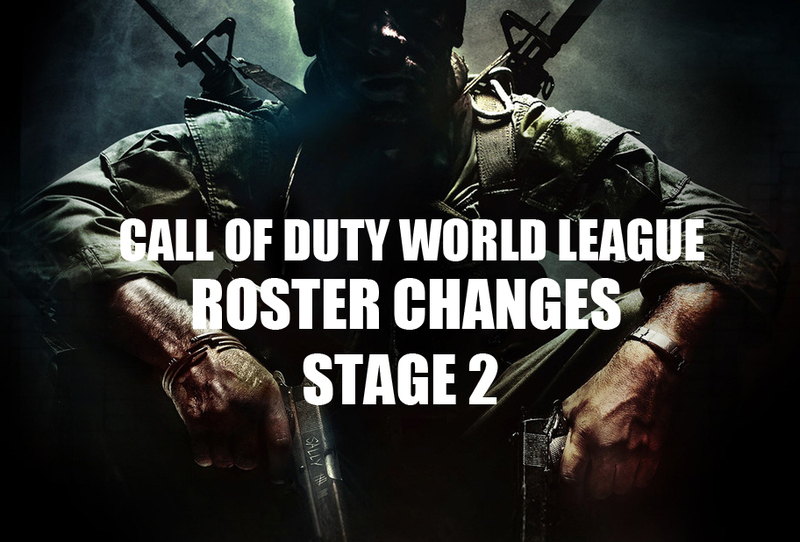 This is it then, Championship point to CLG. If they win this game they will be back to back split Champions. Standard lanes so we should see a lot of fighting this game. Aphromoo gets a bit close and has to flash away…early fights already. 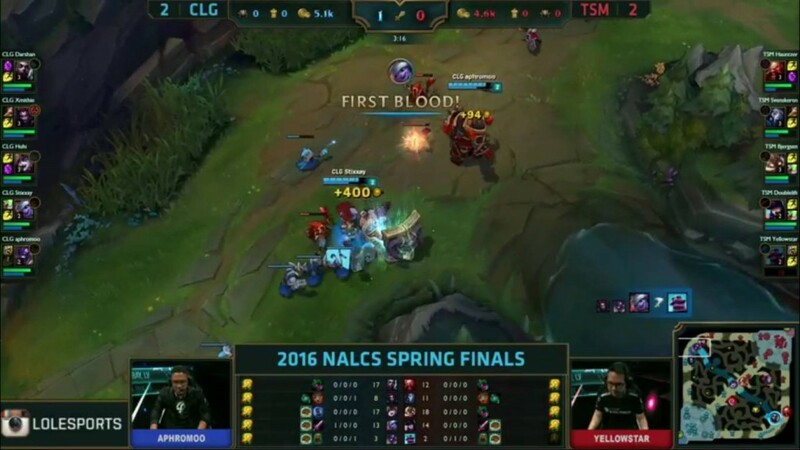 First blood for TSM! 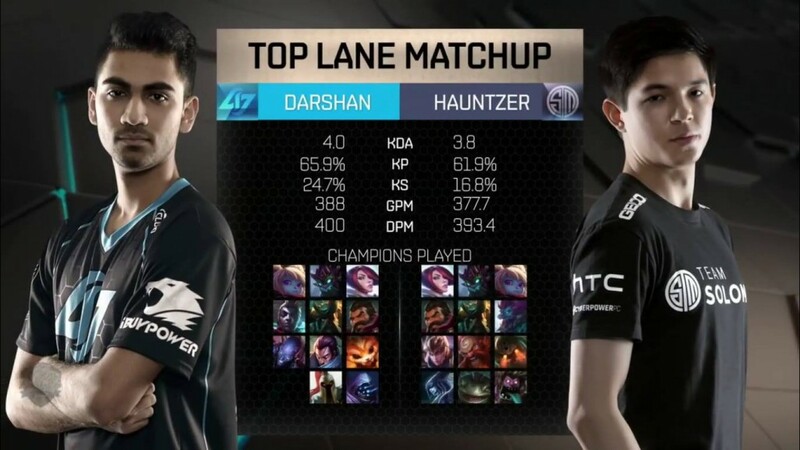 Svenskeren and Hauntzer are able to kill Darshan in the top lane. 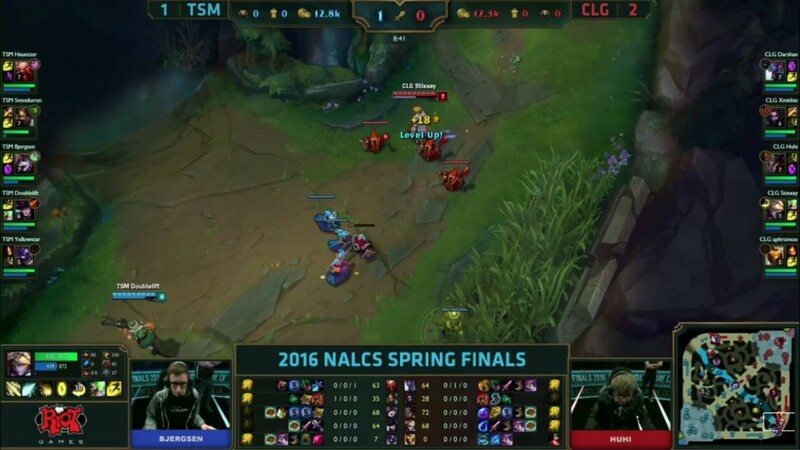 This game is fairly even at the moment but Svenskeren is performing well on this Nidalee. 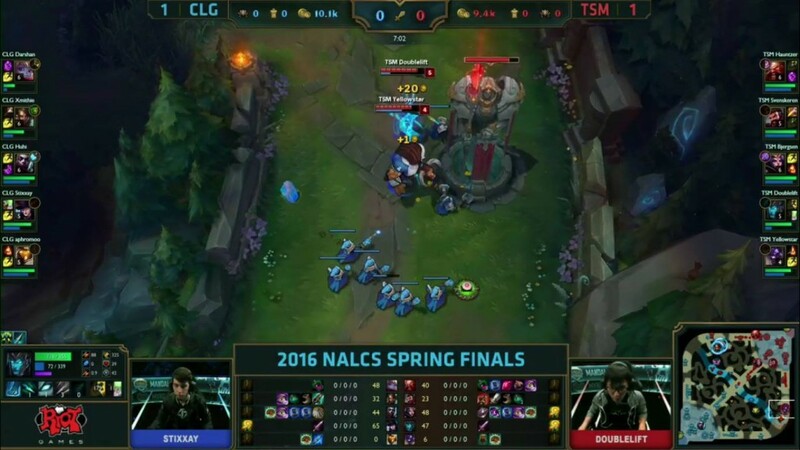 A big item discrepancy bot lane too between Stixxay and Doublelift. 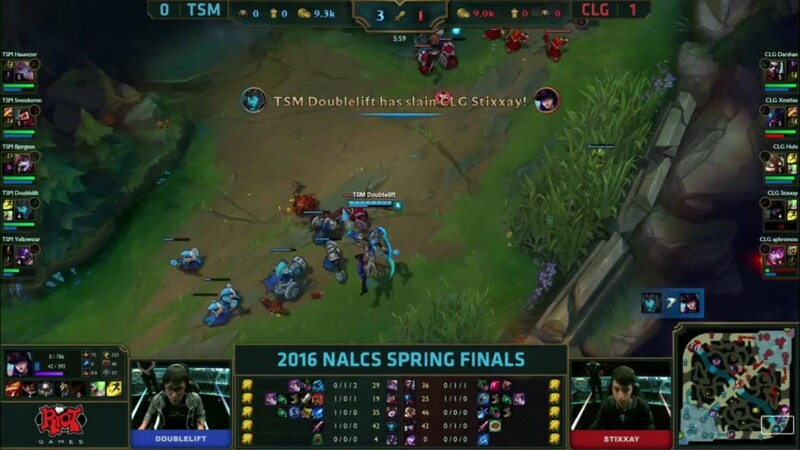 Stixxay has tear + dorans blade but Doublelift has BF sword. 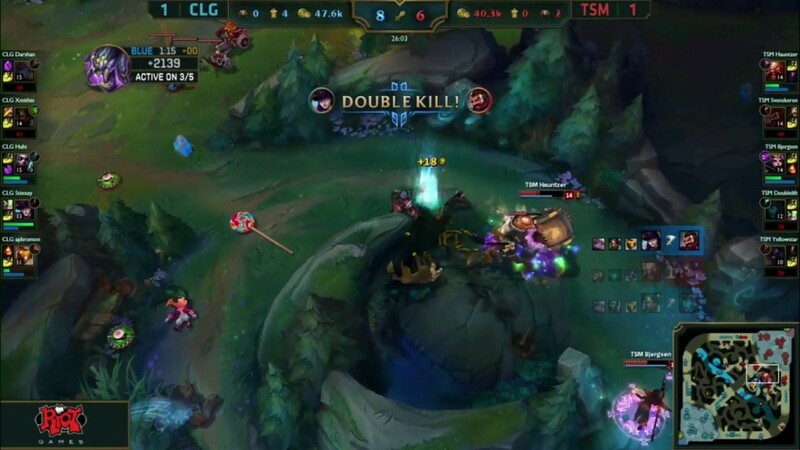 CLG 5 man dive bottom turret and get a kill onto Doubelift. 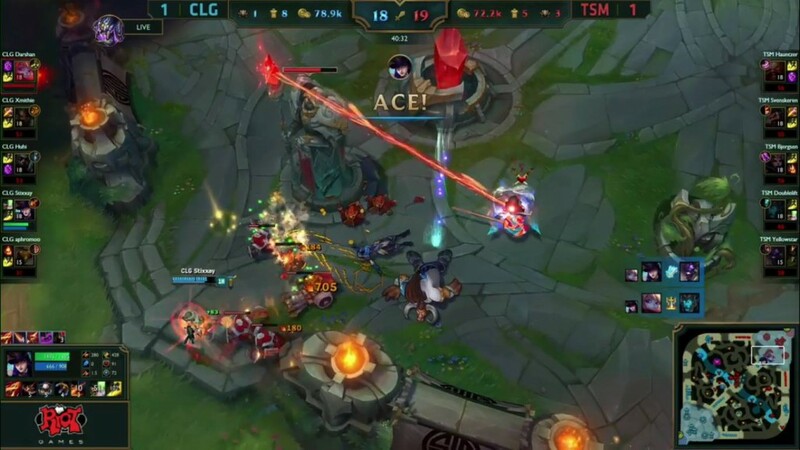 Xmithie goes down though in the process and the a Bjergsen roam is able to pick up a kill – Hauntzer takes top turret too. 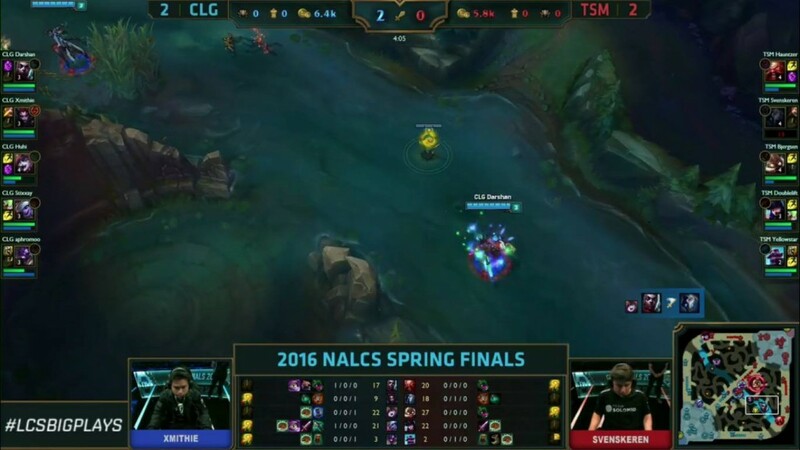 Bad move by CLG. 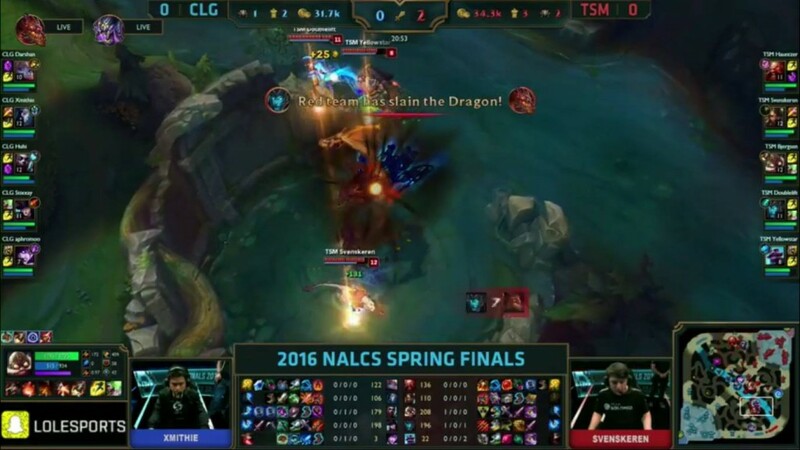 TSM take Rift Herald, CLG take dragon. Why do CLG force this? They need their stacking items but try and engage. They catch only YellowStar with a bard ult but continue in. 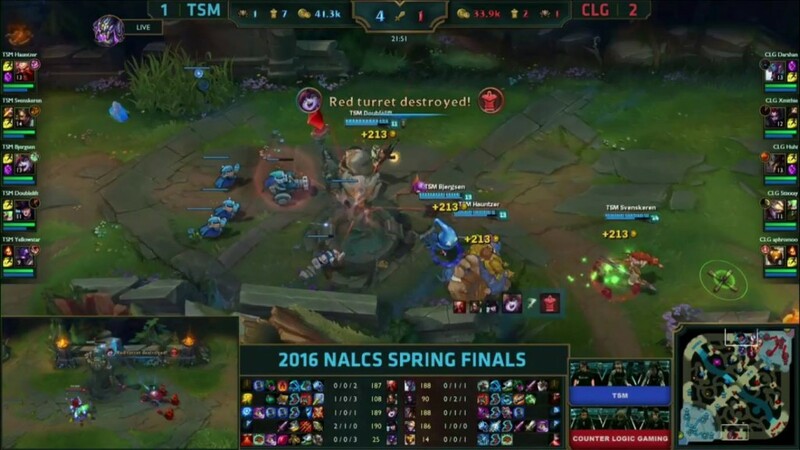 A huge ult by Hauntzer knocks back 3 members of CLG and TSM are able to pick up kills and grab 2 middle turrets. The map is now wide open and the gold lead is 4K. 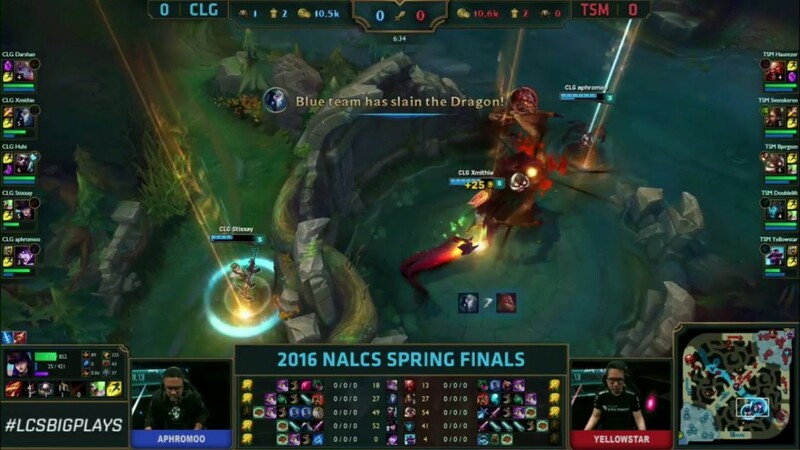 TSM grab the bottom 2nd tier turret and dragon – pushing their gold lead even further out of the reach of CLG. 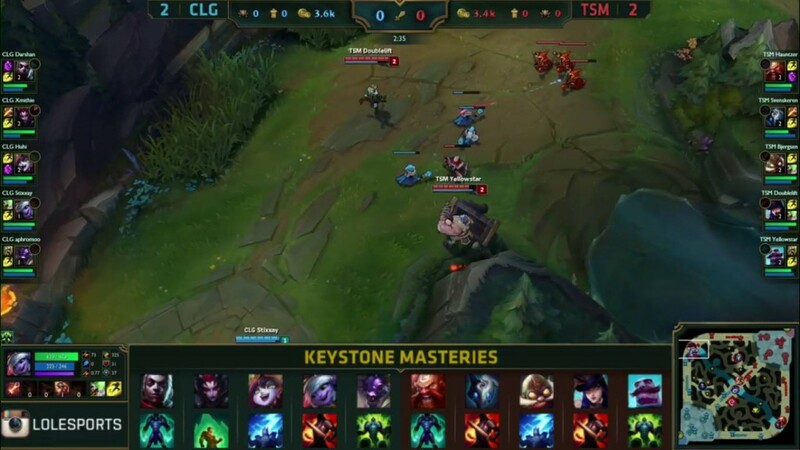 TSM are keeping up cross map pressure here. They take down mid inhibitor turret and transition to the top lane to take top 2nd tier turret. 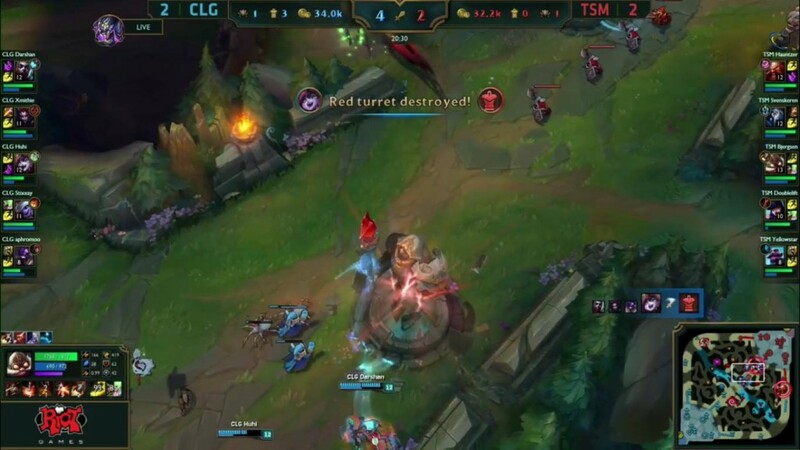 CLG trade back by taking bottom 2nd tier turret. 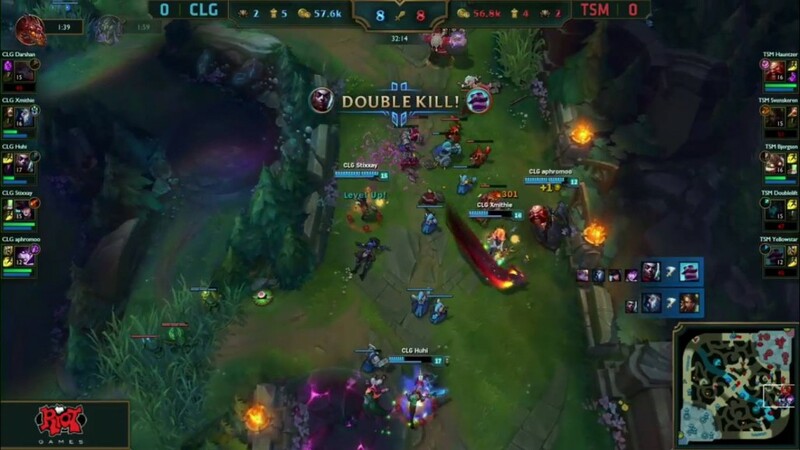 TSM try and siege the middle inhibitor but CLG defend well. TSM get poked out and CLG decide to engage. They trade kills and CLG continue to survive. Both teams just continue to fight for vision control here. Nothing to report as of yet. TSM will start to bait baron soon. Xmithie steals baron! 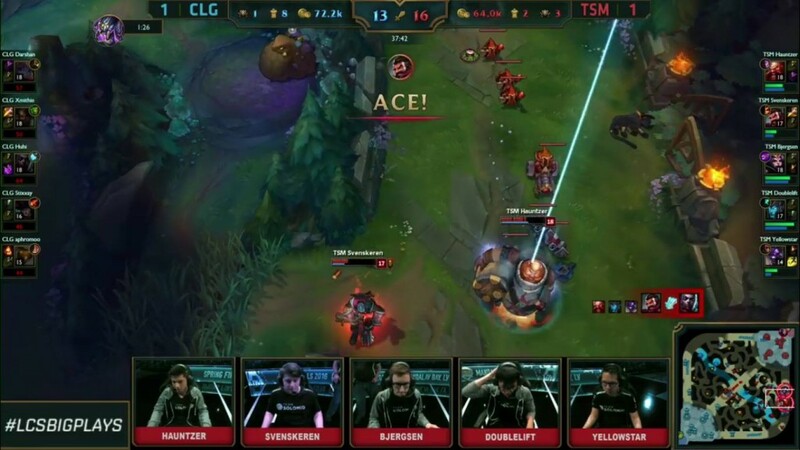 But TSM get 2 kills, can they push to end? 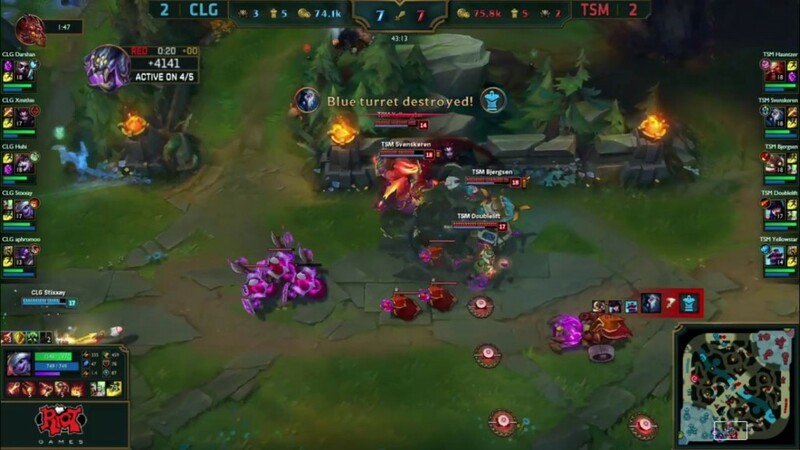 CLG try and make something happen with the baron buff, but their team fighting isn’t as strong as CLG’s! They get aced and TSM push to end the game. We’re going to Game 5! Prepare Silver Scrapes. Game 5 coming up next! 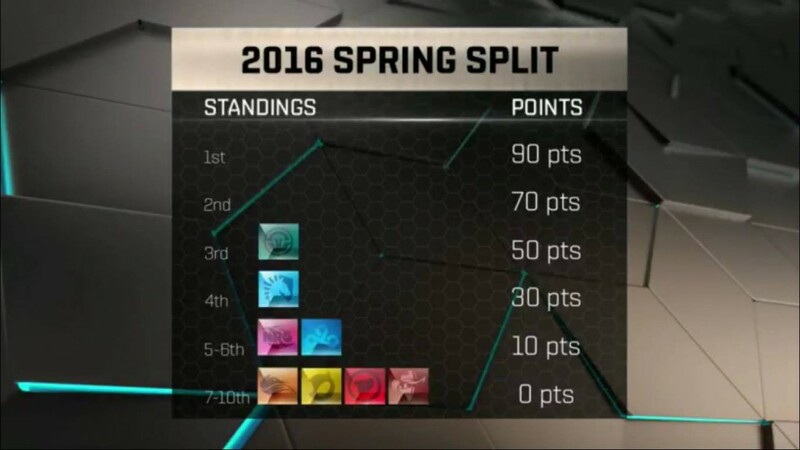 Who will win the Spring Split? The bans are underway! Picks to follow shortly. 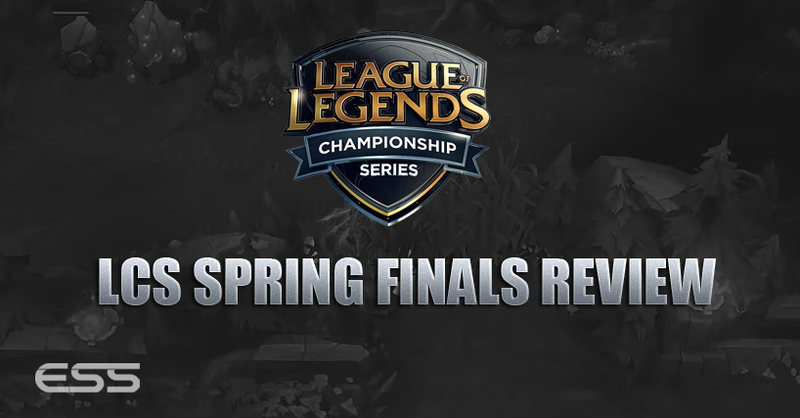 Who will get the Caitlyn that has been so valuable this series? Wow, what a pick and ban phase. 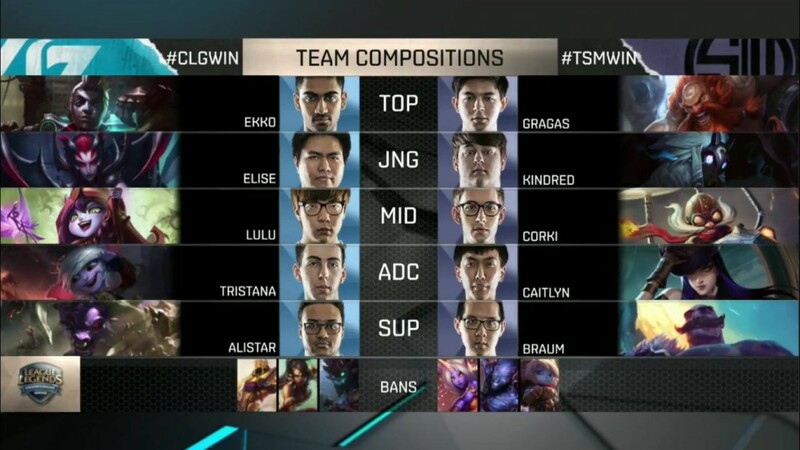 Caitlyn is picked up in first rotation by TSM to deny Stixxay having it – but CLG pick the Tristana in response! 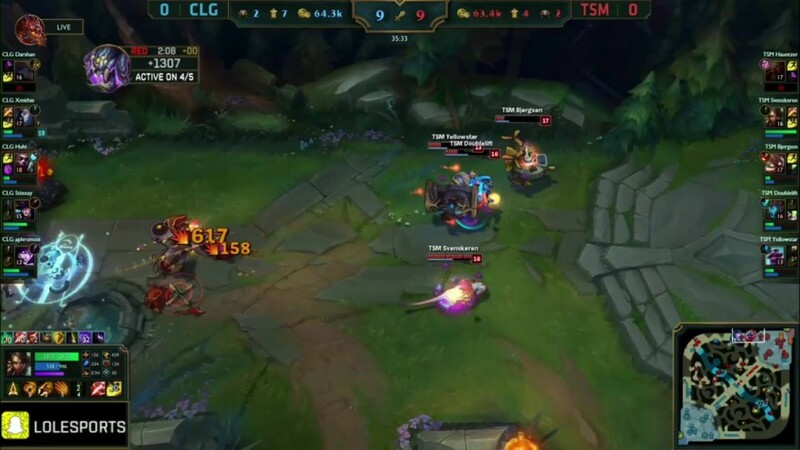 The Tristana was banned 3/5 times in their Semi-Final matchup against Team Liquid. Lets go! 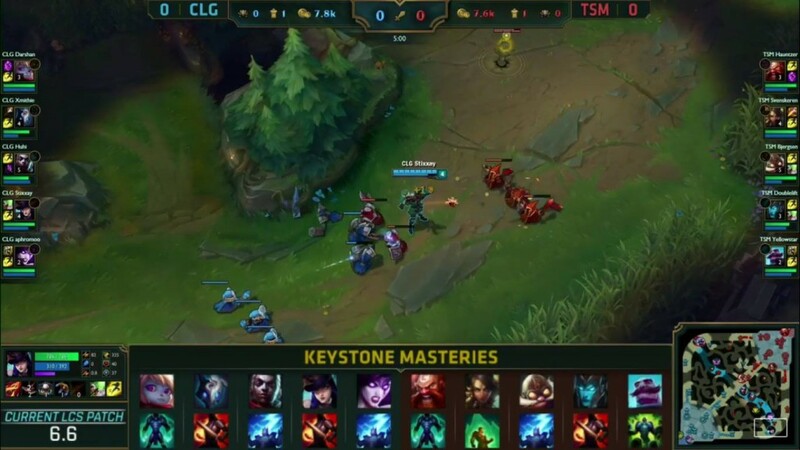 Keystone Masteries for each team. Standard lanes too. First blood for Stixxays Tristana! 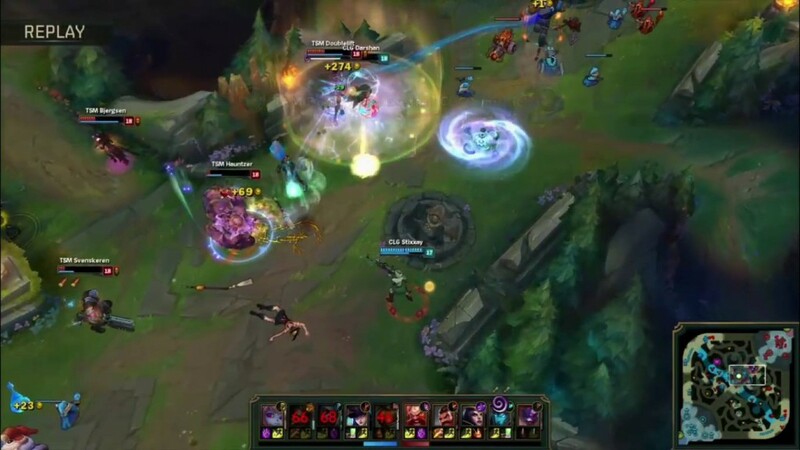 A lovely flash headbutt by Aphromoo on to YellowStar. 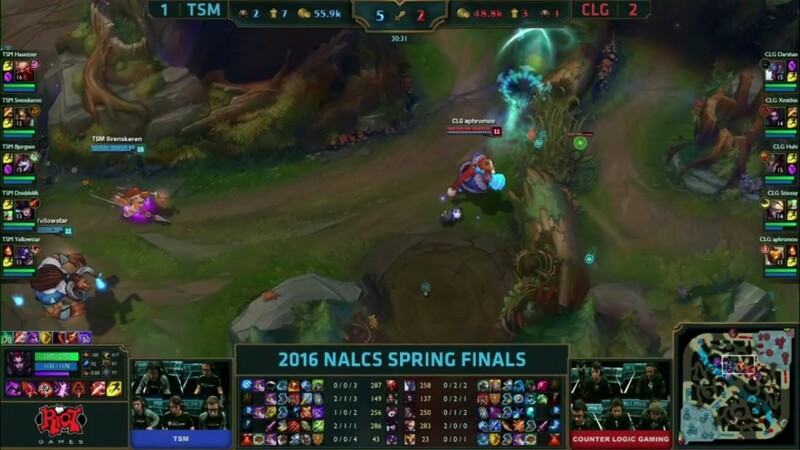 Now Svenskeren is caught out in CLG’s jungle! The kill goes to Darshan who now has the double buffs. 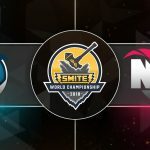 This is going from bad to worse for TSM! Oh no, this is bad for TSM. 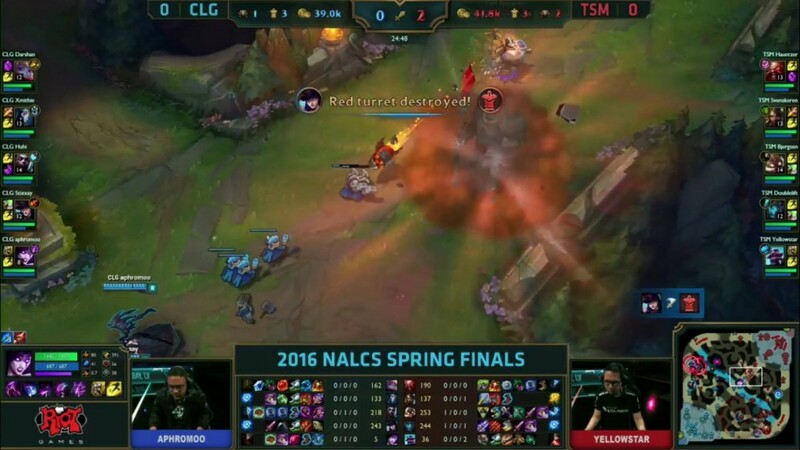 CLG capitalise on Doublelift and YellowStar pushing the wave top. 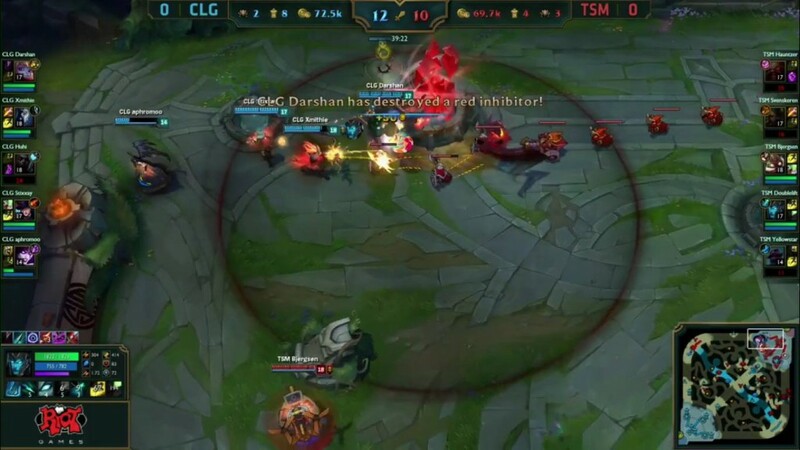 Darshan teleports behind the pair and CLG is able to catch them. 4-0 in kills and nearly a 3k gold lead. CLG look way on their way to taken this series. TSM secure dragon. 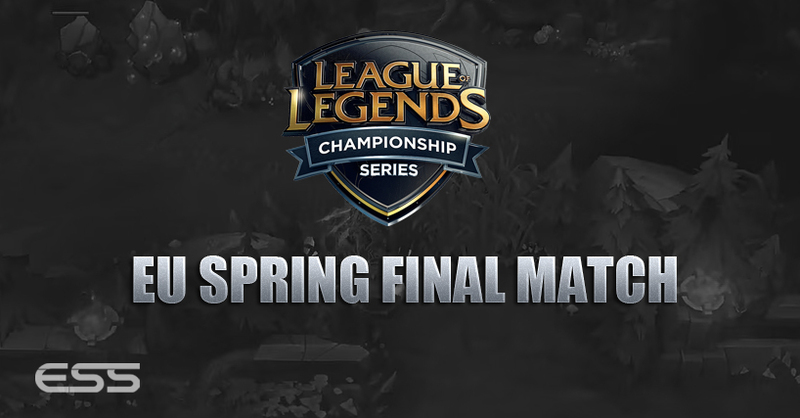 They need to keep farmer up here – Bjergsen and Svenskeren both have a huge CS lead. 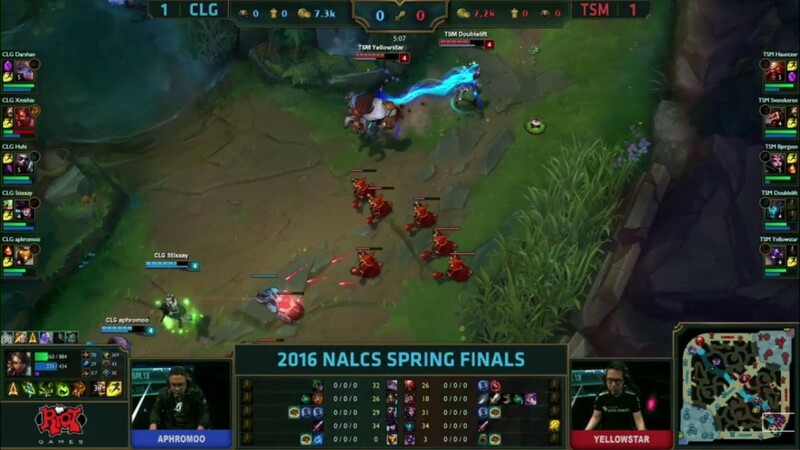 CLG waiting for their power spike here which is Stixxay’s Tristana picking up Hurricane. They need to pull the trigger at the right time though and can’t let TSM just farm up. YellowStar and Bjergsen blow summoners to catch Huhi and they get the kill. 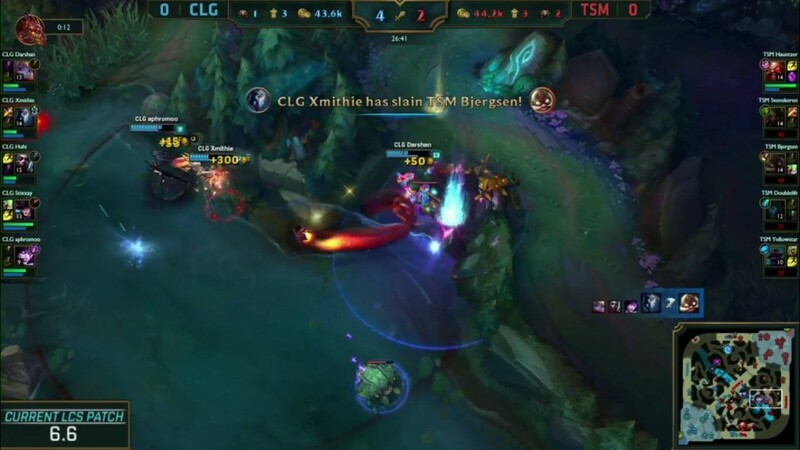 The rest of CLG collapses but TSM still manage to hold their own and Svenskeren is able to take down Darshan.That’s a kill each onto Bjergsen and Svenskeren who were already quite powerful because of their good farming. 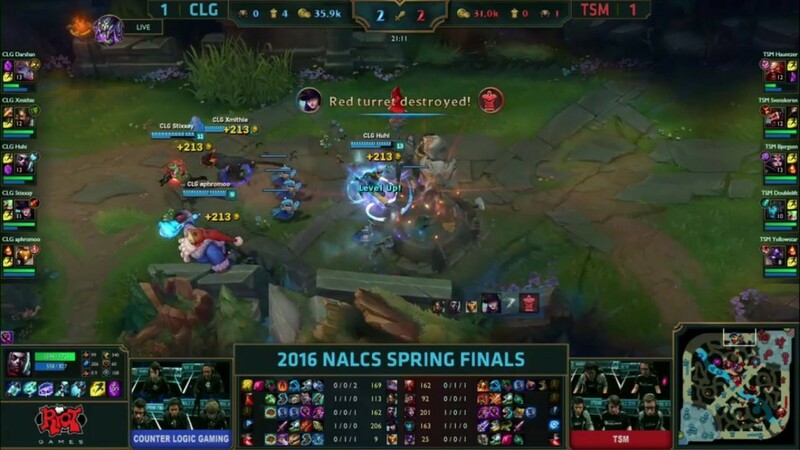 CLG take down TSM’s mid turret and remain 2K gold in front. CLG still in control despite looking a bit jittery at the moment. 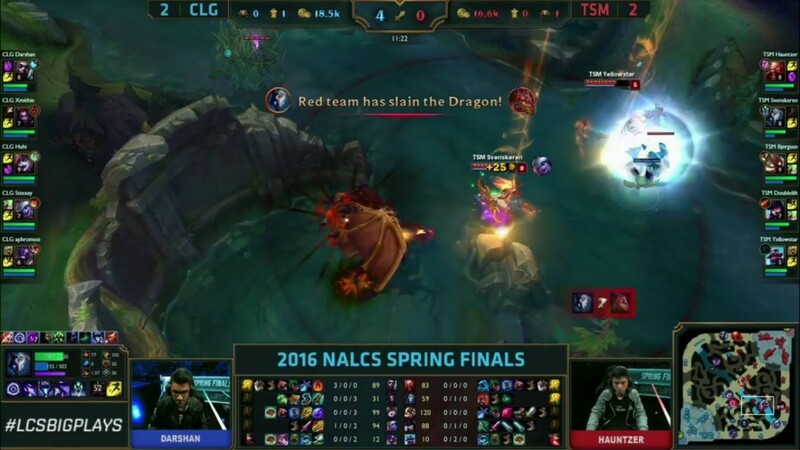 CLG are able to pick up the Dragon as they manage to poke down TSM. 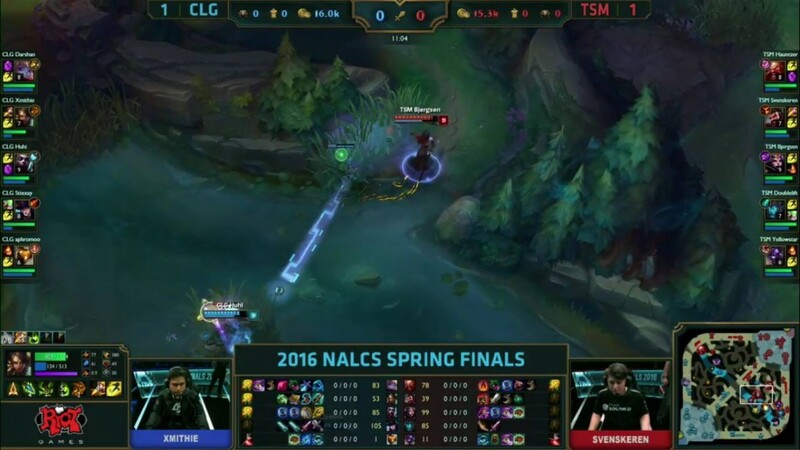 CLG look like their running out of ideas here. 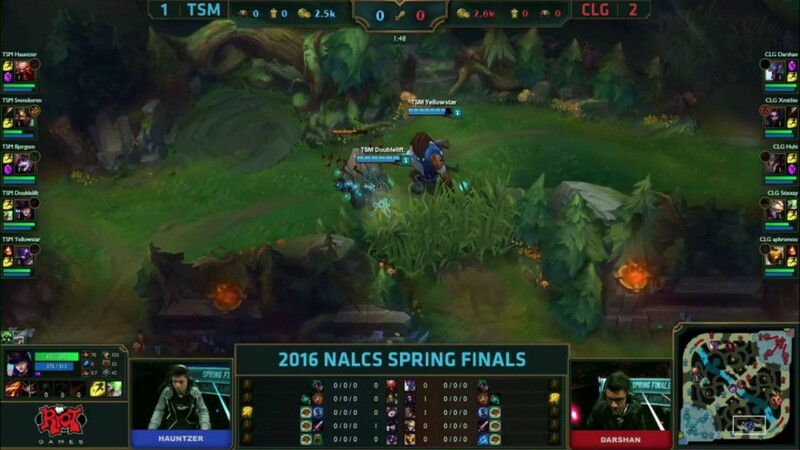 TSM are pulling back this gold lead because CLG are posturing around this mid turret and not really doing much here. 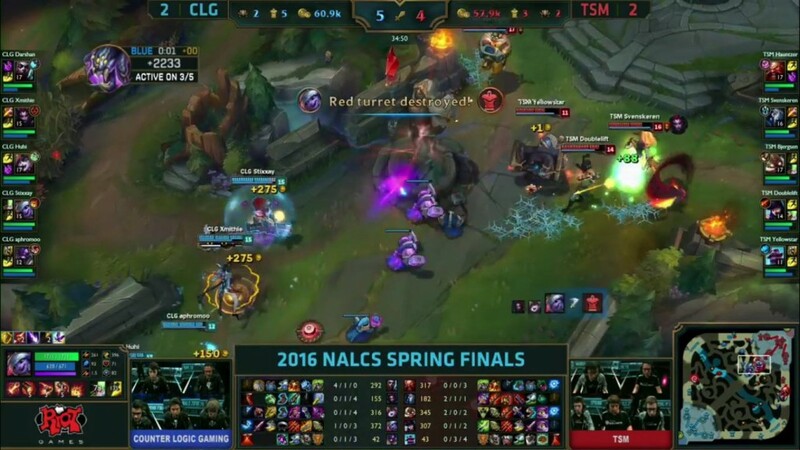 CLG take down Baron Nashor so quick due to Stixxay. 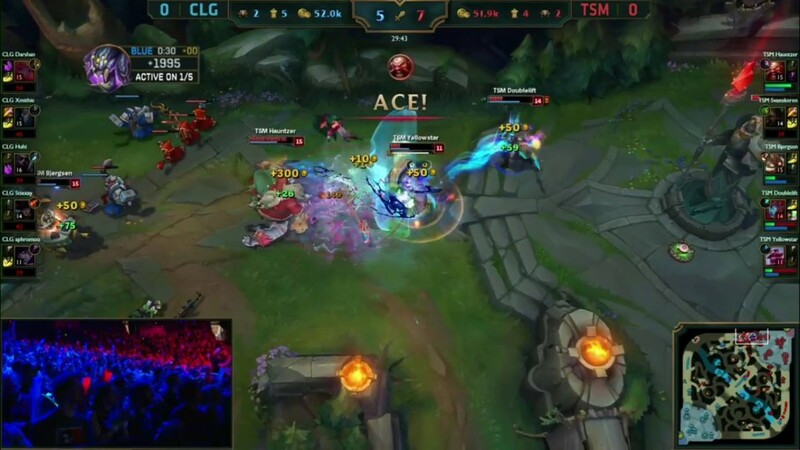 CLG looks to be winning the team fight but Stixxay jumps out and doesn’t expect to find Bjergsen and has to flash away – Bjergsen is able to help TSM and they pick up 2 kills.TSM push on to take 2 towers. 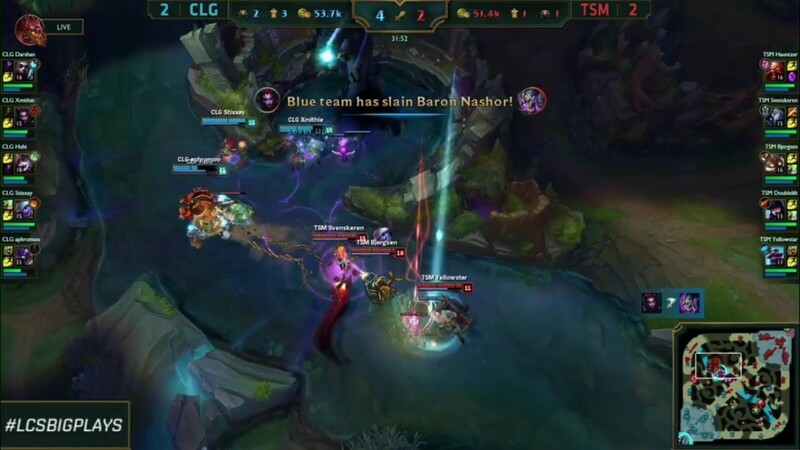 CLG use the baron buff to pick up top and mid tier 2 turrets. 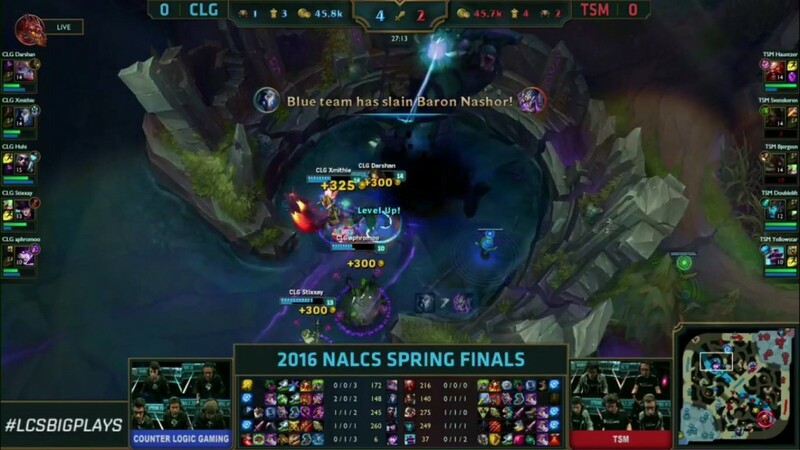 2K baron play for CLG. 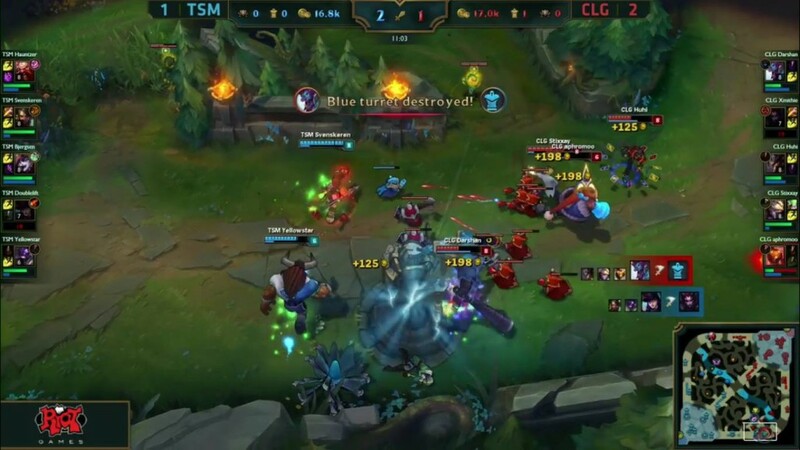 CLG continue to put pressure on towers. Baron and Dragon both spawn in a minute so a team fight should happen! It’ll be huge this late in the game. 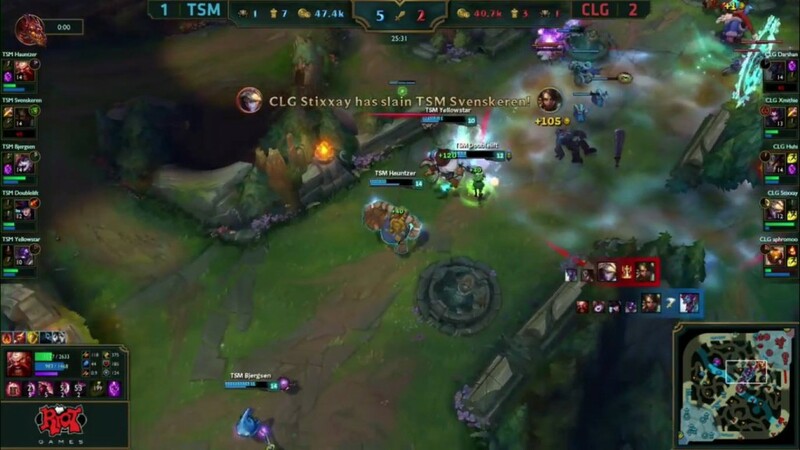 TSM start the Baron and CLG collapse in – it looks like it’ll go well for CLG with Stixxay producing tons of damage onto the tanks of TSM. 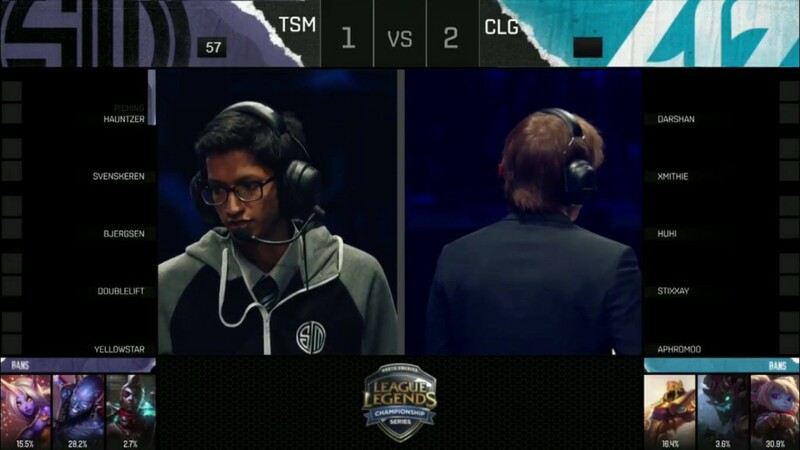 Hauntzer and YellowStar both go down, but the back line of TSM is producing damage of its own! They manage to catch out 3 members and take the Baron! 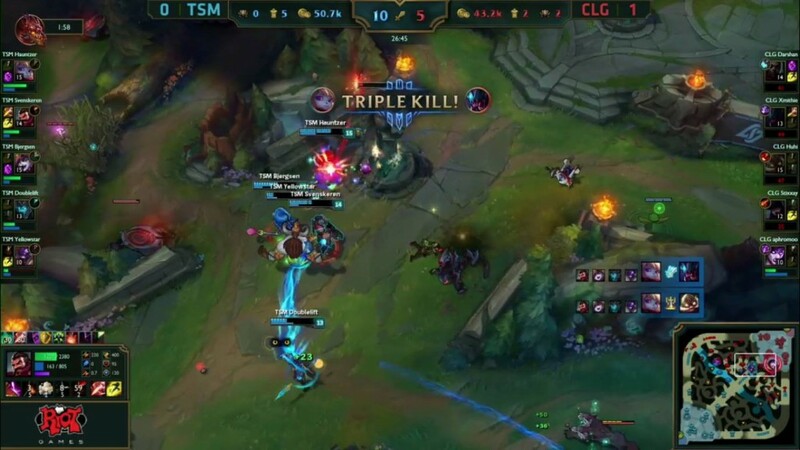 A 4K Baron play for TSM as they take down the bottom 2nd tier turret. Dragon is up in 1:47. What a game this is. STIXXAY! THE RESETS! Oh that’s it. That’s game! 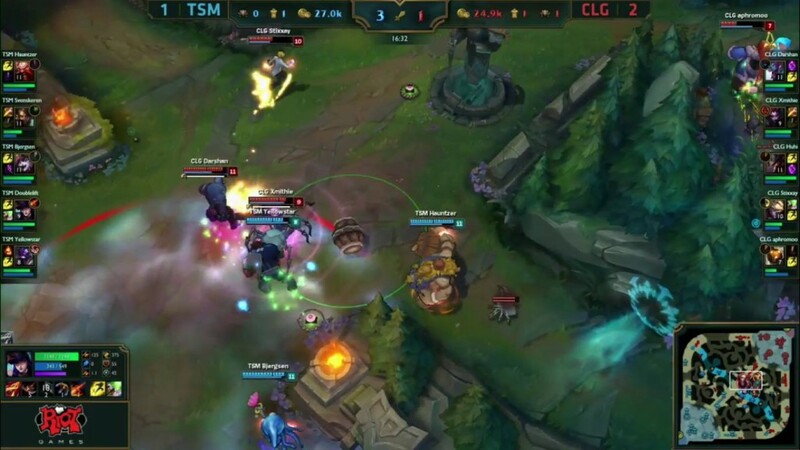 TSM grab Dragon but Hauntzer and his team mates try to force a fight. It all goes so wrong and TSM get aced! CLG push on to win the game. What a game and what a series. 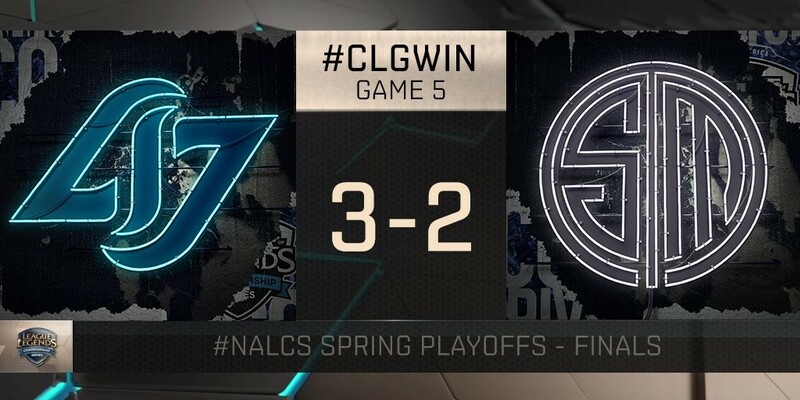 CLG win back-to-back Championships in the NA LCS. 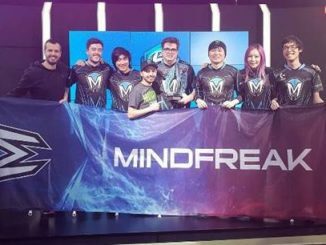 They grab 90 Championship points and will represent North America at MSI.